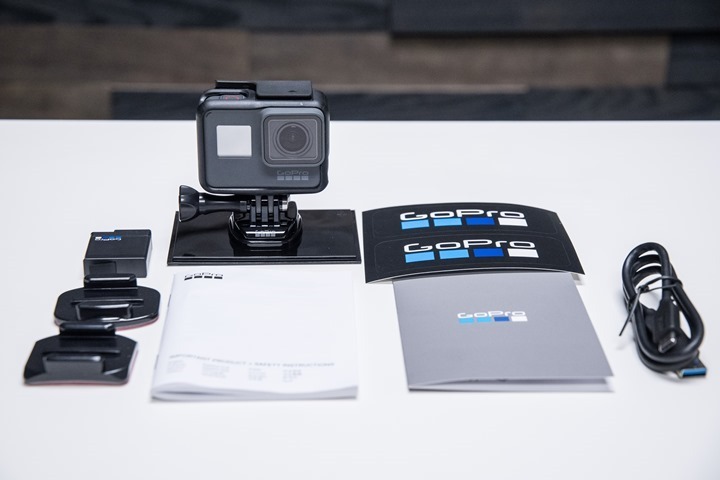 Today GoPro announced their latest action cam – the GoPro Hero6 Black. While it may look the same from the outside, it’s packed with tons of huge changes on the inside. Some of those changes are headliner options like 4K at 60FPS (frames per second), or 1080P at 240FPS. While many of the changes are under the covers at the image processing level, they dramatically change the image quality of both photos and videos. I’ve been testing the Hero6 Black for a bit now, giving me a good grasp of how well the cameras work, both the good and the bad. As always, once I’m done with these two loaner cameras I’ll ship them back to GoPro. You can hit up the links at the bottom if you found the review useful – I appreciate it! I suspect some folks will look at the Hero6 Black and see that it physically looks virtually indistinguishable from the Hero5 Black, and assume that the insides are also similar. This couldn’t be further from the truth. Further, some will look at top-line stats like 4K60 resolution, and then assume the rest is marketing speak. In reality, I’d actually argue the opposite. After using a unit for a few weeks, it’s clear that the lesser mentioned features like low-light performance and dynamic range are actually the real winners here. 1) New 4K at 60FPS: Previously the Hero5 Black was limited to 30 frames per second. 2) Image Stabilization at 4K: Previously this was limited to 2.7K, though you still can’t do 4K/60. 3) New 1080p at 240: This is a significant bump from previous 720p at 240FPS, which is used in slow-mo. 4) New GoPro GP1 Chipset: This in-house chipset for image processing replaces Ambarella, which GoPro and many others have used for years. 5) Better low-light performance: This is probably what I’d consider the two biggest items on the camera. It’s mind-boggling. Also, they increased long exposure to 10-seconds from 2-seconds. 6) Better dynamic range with lighting conditions: Like low-light performance, the speed and clarity here is astounding. Check out my comparison video below to see what I mean. 7) Better image stabilization: 3-Axis image correction in all angles, most notably the roll axis in wide shots (previously it didn’t correct for roll axis in wide). 8) New zoom slider option: You can zoom 0-100% within the image to a custom framing. This essentially gives you tons of flexibility compared to existing narrow/medium crops. 9) New HDR Photo Capture: While previously there was WDR, this is actually a 3-image compilation. 10) Dual 2.4Ghz/5Ghz for downloads: This dramatically speeds up downloads for larger files over 5Ghz, GoPro says this will double speeds, and that seems valid in my case. 11) Changed file formats: For 4K60 and 1080p240, they’ll now use H.265 HEVC file formats, which halves the file space requirement. It also introduces some compatibility issues though (I’ll cover later). 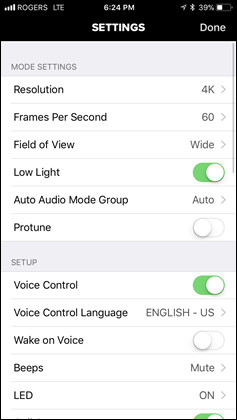 12) Slightly improved voice control: You can now turn on the camera entirely via voice, previously you had to power it on manually. 13) All mounts/cases stay the same: While not new, it’s definitely notable. Mounts, batteries, cases, etc… are all identical to Hero5 Black. 14) Increased camera algorithms: The camera can now detect faces, though it doesn’t expose that yet. It’s used by Quik for processing afterwards. 15) Much faster touch screen: Simply put it’s faster. It responds to commands faster, both in camera mode as well as gallery mode. And actually, there’s still a bunch of really tiny stuff I’m probably forgetting, but these are the biggies that stick out at me. You’ve still got all the existing items from the previous generation, like ProTune for higher bitrate videos and more control over the image, as well as manual audio channel control. As I noted above – I think the two biggest items are low light performance and general dynamic range increases, with the new 4K60 mode and 4K30 image stabilization being a close 3rd and 4th. The dynamic range is apparent in both videos and photos, as you’ll see in some of the examples below. So with that – let’s back up a bit and unbox the unit. After we pull the parts out you’ll find the Hero6 Black attached to a plastic plate. Pro Tip: This plastic plate is actually meant to be kept like a mini-tripod of sorts. The box includes two sticky mounts – one for a flat surface, and one for a curved surface. You’ll likely want more of these down the road. Fear not, you can find giant bundles of these on Amazon for a couple bucks. After that, we’ve got the USB-C charging cable. Fear not, it’s only USB-C on the camera side, whereas the other side is regular USB. And then of course – the camera itself, alongside the battery. 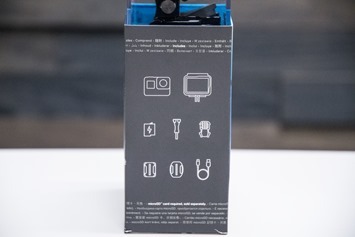 The battery is identical to that of the Hero5 Black, and is totally interchangeable. 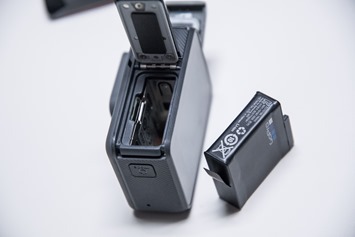 Note above that the battery goes into the battery compartment via the waterproof door on the bottom, it’s the same place the Micro-SD card goes. While on the side you’ll find the USB-C charging port alongside the HDMI port. These are protected by a small removable waterproof door. Said door is removed when you use it with the GoPro Karma Grip/Drone. It’s also incredibly overpriced at $20 if you misplace it (which you will, at the worst possible time). With that, we’ve got everything in the box. Remember that the camera came in the mounting frame (seen up above on the little plastic stand), and you’ll need that anytime you want to mount the camera. Now before we dive into things like the video and photo quality, I want to very briefly cover some basics. First up is that the Hero6 Black is waterproof to 10m/33ft without any additional housing. As long as you’ve got your battery compartment and charging door closed, you’re good to go. 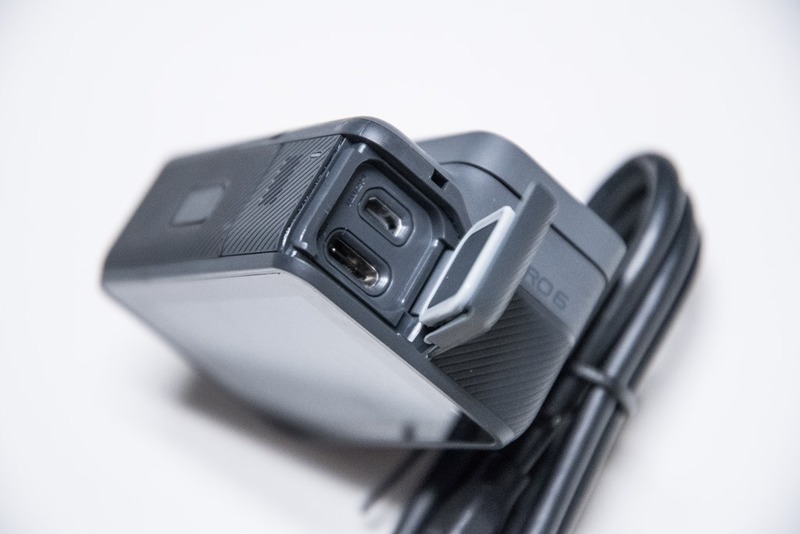 Speaking of which, that little charging door detaches and is easily lost if you use the gimbal a lot (which requires taking it off) at the worst possible time (usually on vacation on some tropical island). I’d highly recommend buying a replacement door and stashing it in your suitcase in some random pocket just in case something happens. That way your GoPro is still waterproof. Next, we’ve got the touchscreen on the back. This allows you to preview what the camera is pointed at, as well as interact with the menus. The touchscreen is also waterproof of course, but doesn’t work well in the water. For that, you’ll want to use the manual buttons to change any settings. 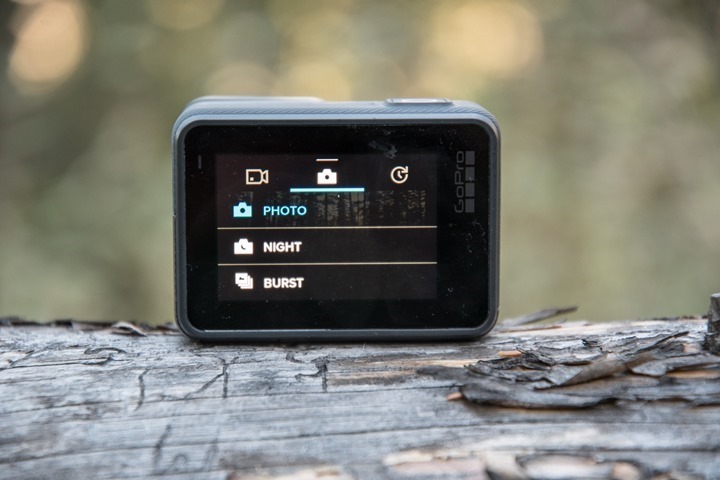 There’s one button atop the camera that starts/stops recording (or takes a photo), and another on the side to change modes and create a highlight. 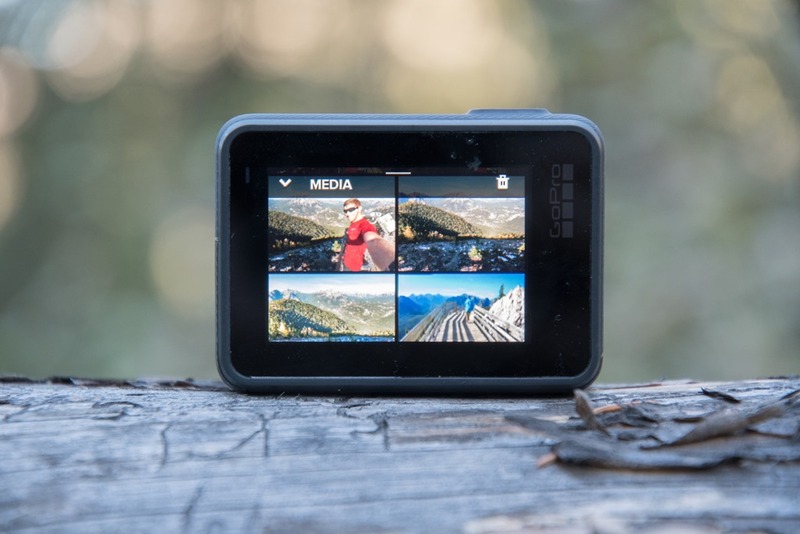 The touchscreen also allows you to review photos and videos you’ve taken right on the spot. The Hero6 Black does bring with it the voice commands of the Hero5 series, while also adding in the ability to turn on the camera via voice. As long as it was turned on at some point in the last 8 hours, it’ll wake up automatically. GoPro says this will only impact battery life about 3-5 minutes at most. From a battery standpoint, there hasn’t been much change in battery time with the Hero6 Black over the Hero5 Black. It’s all about the same, which means shooting at the max of 4K60 you’ll get about an hour, whereas shooting at 1080p/30 (a lower baseline), you’ll be clocking in over 2 hours. The good news is the batteries are the same as the Hero5 Black, which also means 3rd party batteries are the same. I’ve tested these 3rd party batteries in the Hero6 Black with no issues, and they’re a heck of a lot cheaper. From a mount standpoint, the camera will generally be used in that black frame case that came with it. 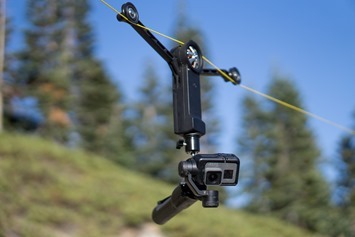 That allows it, in turn, to mount to any GoPro compatible mount (of which there are thousands). It could be a mini-tripod or a helmet mount, or some other crazy contraption. It’s kinda the cool part about the GoPro mount system – tons of creativity in what people have come up with. So, with those super quick basics out of the way, let’s talk about some tech details. First up, we’ll start with the video side of the house, given it’s a video camera and all. The first thing to note is the resolution and frame rate changes we’ve got to work with. With the Hero6 Black you’ve now got up to 4K 60FPS, whereas that was previously limited to 4K 30FPS in the past. Of course, that’s the header item, but the real interesting item is what’s happening below that key resolution. 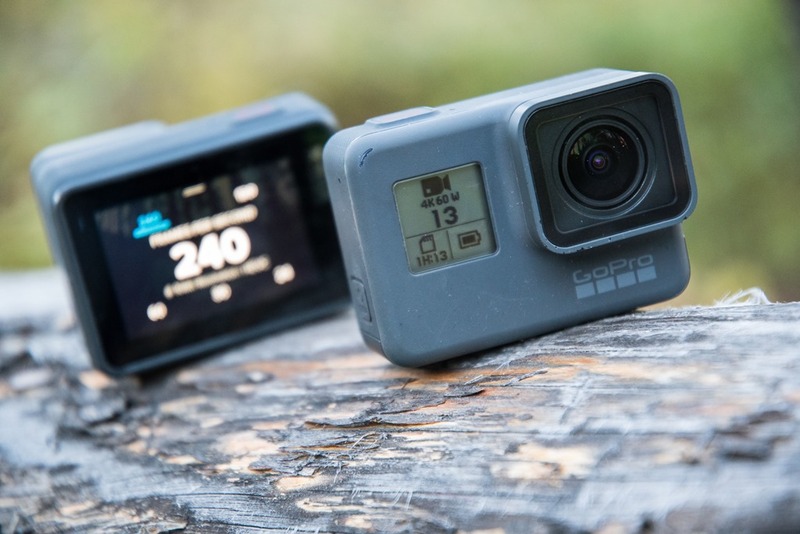 For example, GoPro introduced electronic image stabilization within the Hero5 last year, but that was limited to 2.7K – so you couldn’t take advantage of that at 4K. That changes with the Hero6 Black, which supports image stabilization up to 4K30, and even 2.7K is up to 120FPS now. Much of these image processing changes on the Hero6 black are ushered in by GoPro’s new GP1 chipset. And even the image stabilization itself is now improved. GoPro says this is largely due to the new GP1 image processing chipset. They developed this chipset in-house, to replace the Ambarella chipsets they and other camera manufacturers have used for years. GoPro says the main reason they shifted to an in-house developed chip was that it would give them a competitive edge. Versus previously if you looked at past cameras the core image processing chipset would soon be used by competitors. For example, the GoPro Hero5 Black was on virtually the same chipset as the Garmin VIRB Ultra 30. Of course, some of that’s also marketing and likely a desire to save costs. 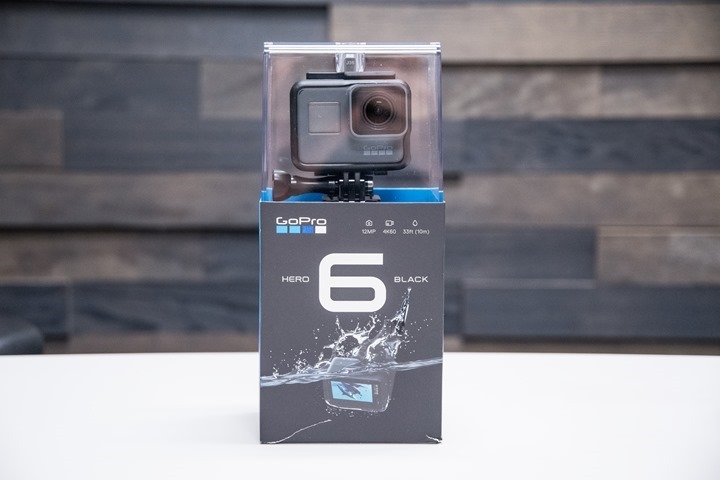 There were certainly newer and better chips that GoPro could have taken advantage of from Ambarella at the time of the Hero5 launch, as well as now the Hero6 launch. Either way, the results are actually impressive, and it’s resulted in a number of improvements I outlined above. The two biggest visible improvements would be better low-light support and better dynamic range, both of which are easily seen in my overview video above. The best way to explain these is that you get better exposure in both bright and dark conditions, as well as faster exposure. 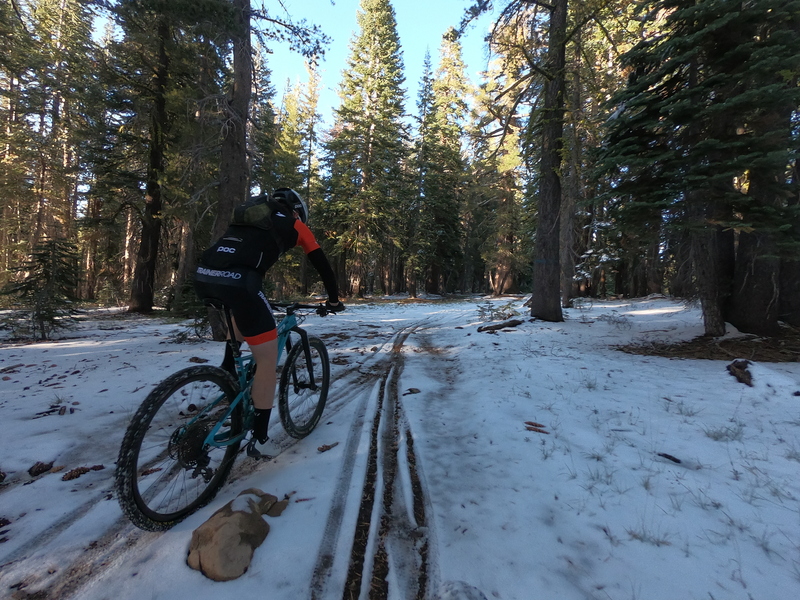 So for example when mountain biking through trees on a sunny day the camera reacts very quickly to lighting changes so you don’t end-up with image blow-outs. Whereas all other modes use the existing H.264, as that’s more widely compatible. And in fact, there are a bunch of caveats to be aware of with H.265, mostly around compatibility. For example, when GoPro’s main smartphone app automatically transfers footage to your phone when within range of the camera, it won’t do so for H.265 footage. That you’ll have to transfer manually. Further, for H.265 footage you can’t preview it from the camera, you have to transfer it first. And finally, older operating systems and apps won’t support it. Even as of today, September 28th, 2017, the video editing giant that is Final Cut Pro X doesn’t support it. So you have to spend considerable time converting all your clips first, which makes puppies die. 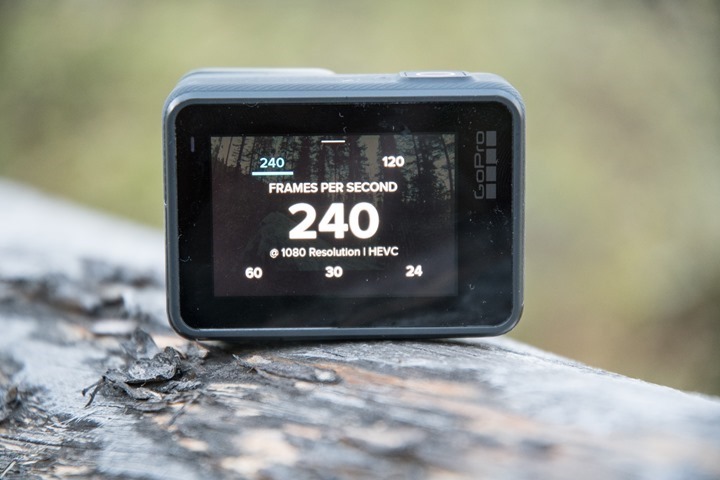 One of those new modes is 1080p240, which enables you to really slow down the footage you capture in high-speed situations. Previously GoPro only offered 1080p120, or 720p240. There’s a massive difference in quality between the 720p and 1080p at 240FPS. 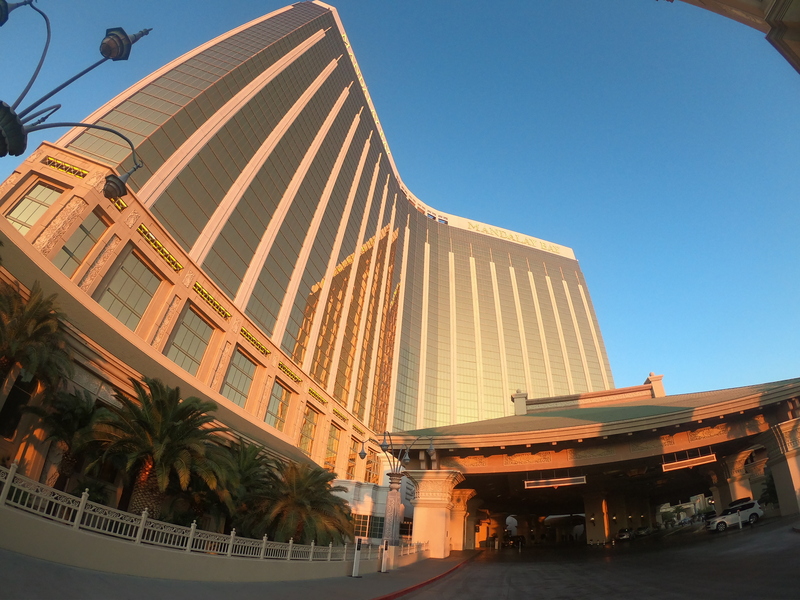 It looks spectacular on the Hero6. You can check out some sample footage I did with exploding water balloons within the main video up above (about mid-way through). 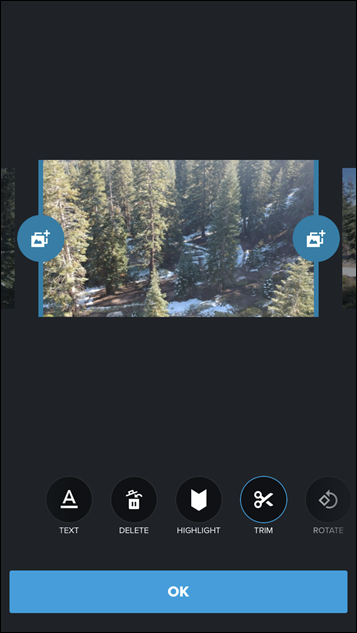 Next, the Hero6 Black allows you to use a small zoom slider to zoom in on the image within certain modes. 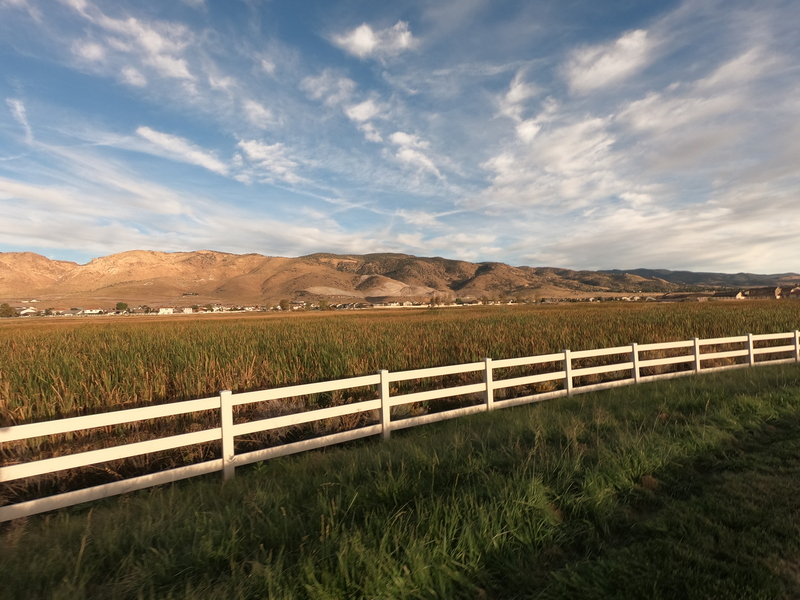 This gives you more flexibility than the typical Medium/Narrow crop options, since you can use the slider anywhere between 0% and 100%. Note that it’s not available on all modes, like 4K60 or 1080P240. 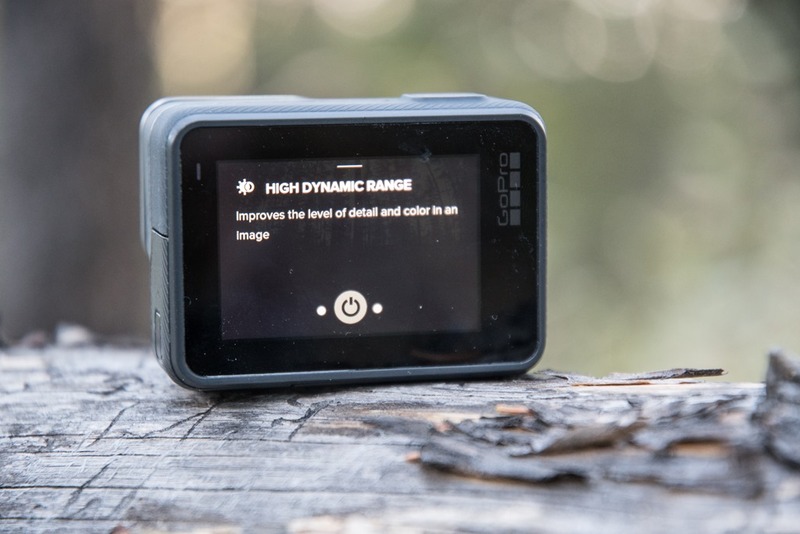 Finally, like in the past, you’ve still got ProTune mode for making changes to the camera settings (like exposure and color profile) on the camera itself, as well as giving you more flexibility later in post-production. That also goes the same for audio flexibility with the three microphones that are on the GoPro Hero6 Black as well, enabling you to record individual mics if you’d like, or have it do automatic wind reduction for you. All in all, things are pretty impressive on the video front. As I said in the video – it’ll be easy for folks to get focused on 4K60, but that’s not really the star of the show here. It’s how well it performs in lower-light conditions as well as the clarity and dynamic range that’s the real winner. That said, the HEVC file format will likely be a stumbling block in the short term, at least until app and platform compatibility catches up with it. Next, a quick chat on audio. The Hero6 Black, like the Hero5 Black has three microphones on it. These microphones are arranged in a manner that allows them to do wind cancellation by using the microphone not hit by the wind. Most of the times it works, but not all the times. What’s cool though is that you can enable individual track recording via ProTune, so that each of the microphones is recorded individually to the MicroSD card, alongside your video. This gives you ultimate control in post-production (albeit, an ultimate headache to deal with). Still, the option is there. While GoPro says audio quality is improved over the Hero5 Black, it sounds pretty similar to me. I suspect what they’re saying is that there are various edge cases that the Hero6 Black has improved upon. A few items here, a few items there. Nothing wrong with that, but I don’t see wholesale improvements across the board. As you can see (err…hear), the audio quality depends a bit on the situation, but also really more on whether or not it’s in the frame case. The frame case definitely hurts audio quality in most situations, but certainly not all. You can see in the running portions it actually sounded pretty darn good, whereas at other times with secondary noises (like the last audio clip), it reverberated the sound a bit, making it sound worse. Ultimately, if you learn where the mics do well and not well, you can get pretty OK quality from it (like, Pro Tip: Don’t touch the mics with your fingers while holding it and talking). At the same time, the reality is that a waterproof camera will have lesser quality from an audio standpoint because more protections have to be put in place than a non-waterproof camera. If you’re looking to use it to vlog or other speaking-focused thing, I’d encourage you to look at other options (it’s why 100% of top vloggers use dedicated mics). But, if you just want to capture the moment and not fuss about perfect audio quality – it does a pretty darn good job. Next, we’ve got photos, where an action cam is one of the main ways I take photos during workouts. Within the Hero6 Black you’ve got all the same modes you had in the past, so things like burst mode, time-lapse mode (both photo and video), as well as the ability to control photo exposure via ProTune. But you’ve also got some new stuff. Most notably a new HDR mode, which is different than the WDR mode in the past. 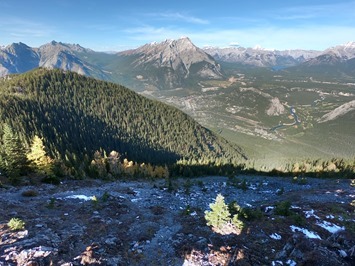 HDR works much like that on other cameras/phones in that it takes multiple frames with varying exposures at once and combines them together into a single photo. 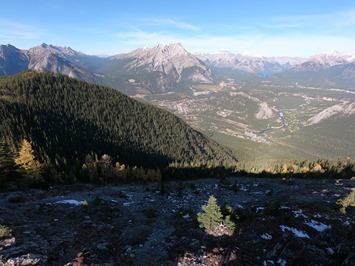 The result is a photo that in some cases could have much better visibility in the shadows, and not be as overblown in the highlights. Take for example this comparison left and right. The one on the left is regular, versus the one on the right is HDR. You’ll notice the ground on the non-HDR one is underexposed, whereas on the HDR you see everything. The concern you sometimes have with HDR though is things end up looking ‘fake’, with too much saturation or contrast. And that can certainly happen here. But I find it’s less work to take an HDR photo and fix some things on my phone (reduce contrast/saturation), then it is to do the opposite (fix lack of detail in shadows or overblown areas). It’s just brilliant. Shooting the desert is always tough, especially later in the day. This came out fantastic. For fun, here’s a small gallery of photos I took, all of which are non-HDR, straight out of the camera. Lastly, one item worthwhile noting is that you can now specify the exposure in photos up to 30 seconds long. This allows you to get legit night scenes (albeit probably not with action). 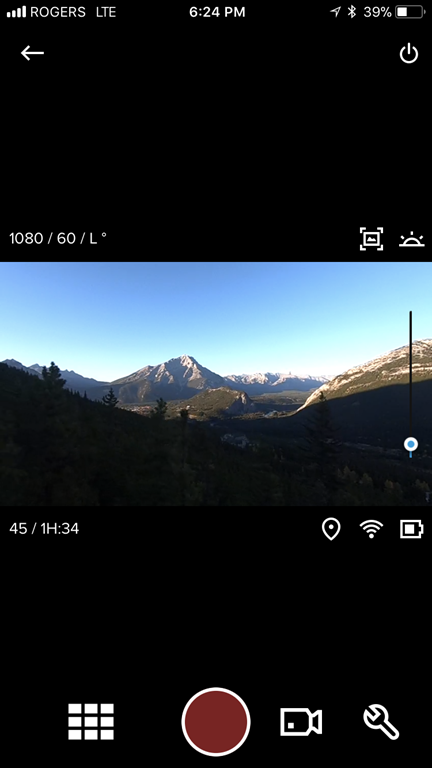 This feature also carries through to the time-lapse mode as well, so you can use it in conjunction with that. Further, you’ve still retained the RAW format for photos as well, so you can enable that to get more post-production control. Finally, we’ll wrap up with GoPro Capture and GoPro Quik. 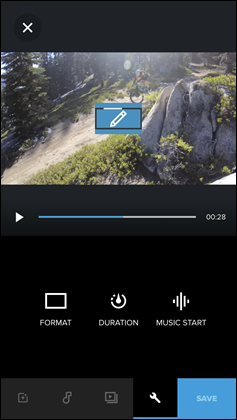 GoPro Capture is their phone app that allows you to control and offload files from the GoPro action cameras to your smartphone. 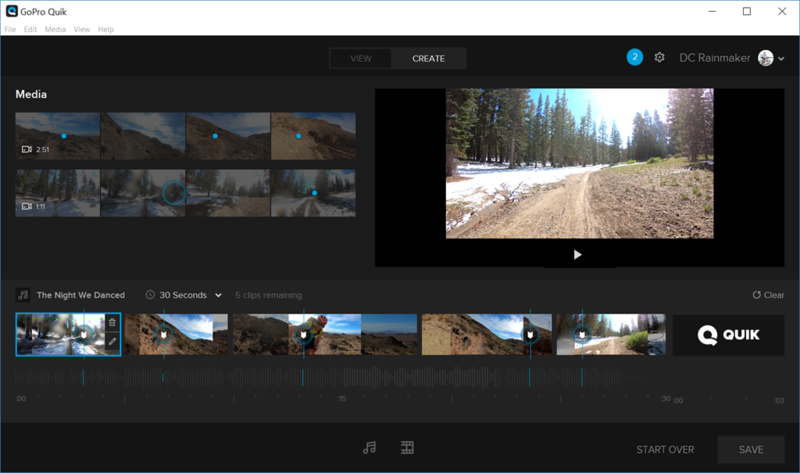 GoPro Quik meanwhile is an editing tool that allows you to quickly generate ‘edits’ (videos) using your captured content. The app can leverage things like accelerometer data, highlights, and even facial recognition to pull together an automated edit of your day. From a camera control standpoint, you can change virtually every setting on the camera remotely using WiFi (up to the range of WiFi). I say ‘mostly’, because sometimes it’s a bit finicky. Also, it doesn’t automatically transfer over any of the higher end stuff, like 4K60 or 1080P240. You have to do that manually. Further on the ‘mostly’ front, you can’t preview 4K60 or 1080P240 content from your phone via WiFi to the camera, you have to download it all to the phone first (the whole file), which can take a long time. So that’s definitely a bummer. Part of the conduit though from Capture is over to GoPro Quik, which is their editing app. It’s here that it’ll put together automated day highlights, or, you can create your own. You’ll start by pulling in footage, both from the GoPro as well as anything else you’ve got on there (like phone videos/photos). Then you can go ahead and choose a theme, duration, and music as well. All of which usually doesn’t take too long. At this point, you can tweak the edit as you see fit by adjusting clips and some basic special effects. It’s somewhat the perfect app while sitting in an Uber to the airport to knock out an edit before your flight home from vacation. As you can see, I didn’t spend a ton of time within the app. Instead, I just let it do its thing for the most part. It’s also dependent on the footage you give it. So I had less establishing shots with this – as well as less variety on this specific day that I fed it (since it didn’t pull in the 4K60 footage automatically). Still, it’s not too shabby for minimal effort. Next, I can simply tap exciting moments throughout the video clips, which in turn add the dots (clips) to the timeline. 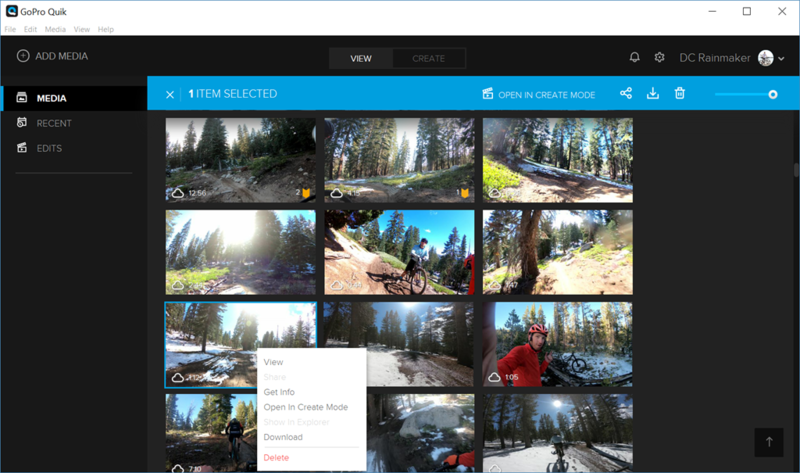 It’s essentially pretty basic though, you don’t have a lot of customization you can do here like you would in Garmin’s VIRB Edit that has near limitless possibilities (especially including customizations). So I’ll go back out and capture some more gauge-friendly footage in the next few days to add in, though it seems pretty similar to what I saw on the Hero5 Black (including various updates since then). In any event – after that’s done you can export out the Quik story which is cut to music just like on the mobile app. And all and all, GoPro’s made some pretty solid improvements here in the last year on this front. Things are much cleaner than before, with most of the kinks worked out. It’s not going to be for power users (I won’t likely use the desktop piece ever), but it’s definitely great for many others. The mobile app piece though I’m far more likely to use to put together short edits for Instagram or similar. Oh – and you can make your own comparison charts using the comparison calculator here, so if you’ve got different cameras you want to compare – go forth! As for why not the Yi 4K+, the main reason is it just feels cheap. 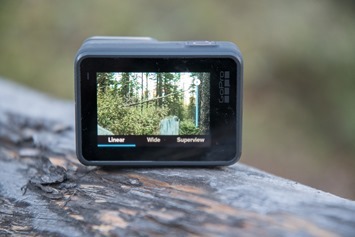 Be it the waterproof case with the poor latch mechanism that easily falls off, or the construction of the unit itself. While it does make some decent footage, I’m not sure it’s worth the tradeoff in an action scenario versus some of the other options. Perhaps as more of a static b-roll camera. Just my two cents. 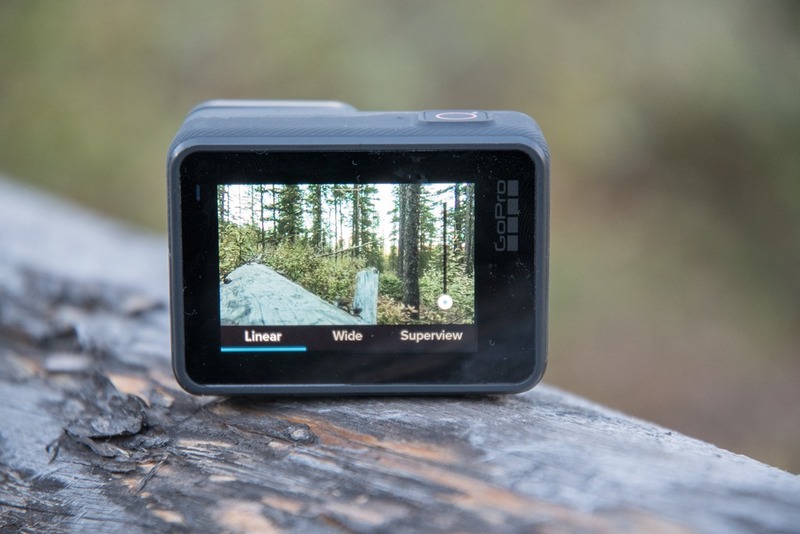 When it comes to comparing this to the Garmin VIRB Ultra 30 for sports, that’s a tough one. This easily bests that camera from an image quality standpoint, but does still lag behind for things like data metrics. 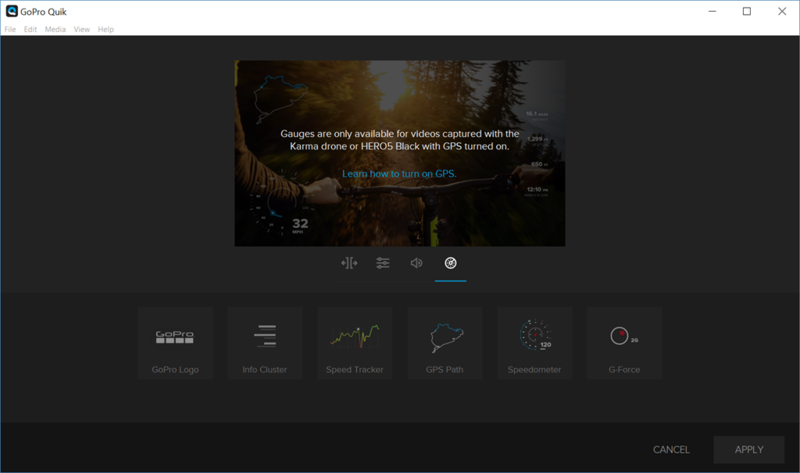 Garmin dominates data overlays and such, and GoPro isn’t playing in the same league there. On the flip-side, if you’ve got a secondary Garmin device to capture those metrics, you can use the GoPro camera footage with that data. So perhaps that’s an option for some. Overall, I’m blown away by the GoPro Hero6 Black. 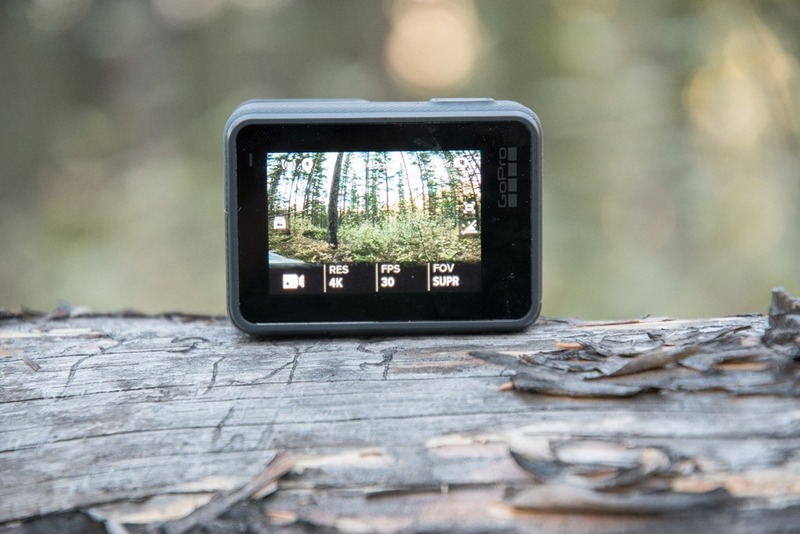 As regular readers know, I’m all about a few core things, and in particular with action cameras: Image quality, ease of use, and the end-state specs. And in all three categories this nails it, especially image quality. But even with recent improvements over the past year for the GoPro apps, things got considerably better. And of course, having the flexibility of 1080p240 and 4K60 is huge. 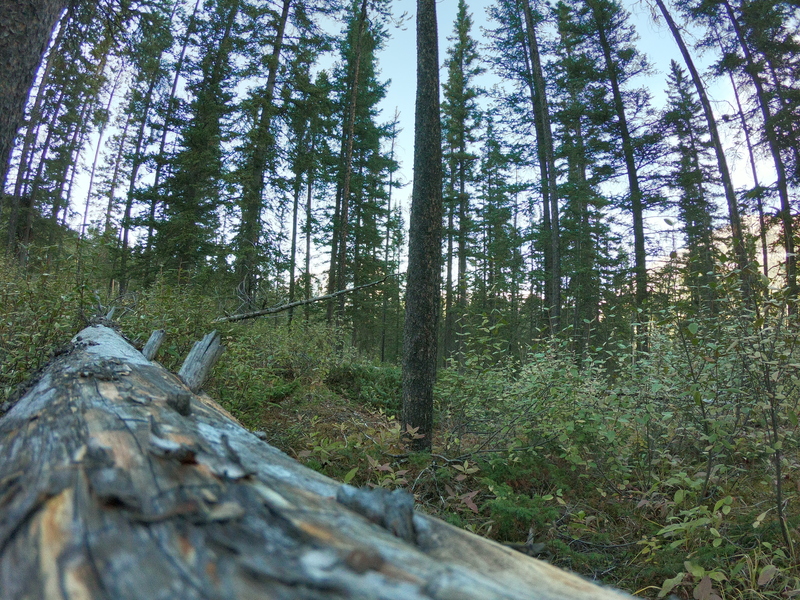 Which isn’t to say there isn’t room for improvement from GoPro. Certainly, there is. 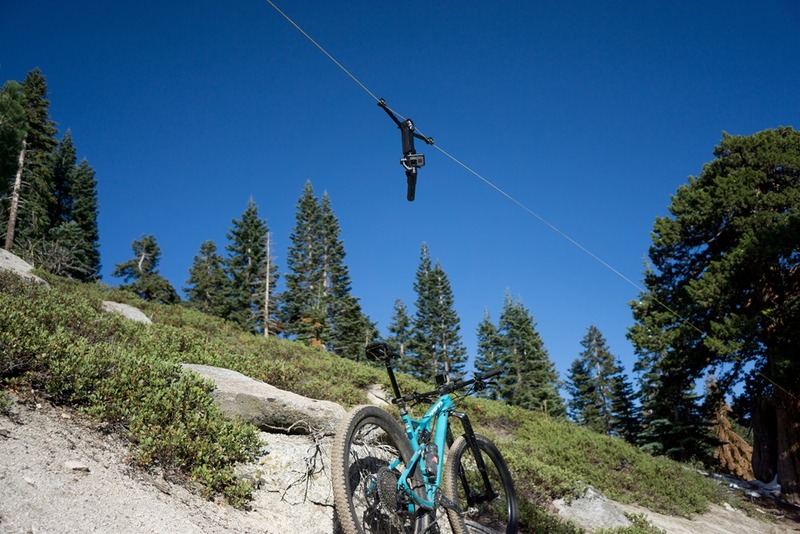 Things like the lack of automatic transfer of higher end footage to GoPro Quik is one area. 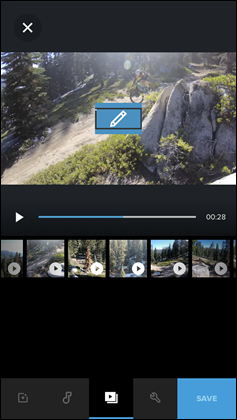 As is the ability to preview that footage from the mobile app while on the camera. And then pieces of the desktop app are still occasionally frustrating. Still, from a hardware standpoint, I have almost no complaints (ok, maybe that little $20 charging port cover). Overall though, this will undoubtedly be my ‘daily driver’ action cam that I use all the time. Additionally, you can also use Amazon to purchase the GoPro units (though, no discount). Or, anything else you pickup on Amazon helps support the site as well (socks, laundry detergent, cowbells). If you’re outside the US, I’ve got links to all of the major individual country Amazon stores on the sidebar towards the top. Great review Ray. Definitely want one of these following my accident with my Hero 5 in the Adriatic! Is that the new shorty mount you were using in the video? Looks more convenient than the three way? Yup indeed. It’s nice for running actually. I did some videos of something totally unrelated yesterday running with it and it worked out well. For cycling I still prefer the 3-way. What about the Cable camera you are using there? They launch in a few weeks and I’ll have a bit of a first look out around that time. I’ll also release more footage in the next day or two. Deal with conversion of all this 4K60 footage because FCP doesn’t support it has been killing me. Really slows everything. Hoping that since iMovie got the update for H.265 a few days ago, maybe FCP will be next. 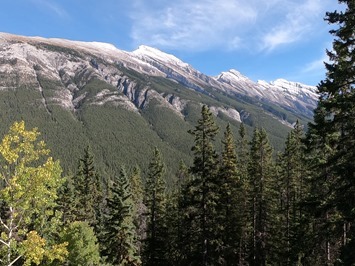 The links for the first HDR comparison shots of the mountain range both point to the same image. I must shamefully admit I took a bit too long to realize this. Weird, no idea why/how it did that. Either way – all fixed! Thanks for the heads up! Any UK buying links yet Ray? Amazon.co.uk doesn’t seem to have it, and neither does CleverTraining.co.uk. Only place to buy in the uk appears to be Garmin direct? Sorry one more question – do you think the faster transfers negates the need for a Quik Key? It seems to, at least if you’re shooting under 4K60/1080P240. Once you get there, then it’s a bit more helpful if you have a lot to transfer. Amazon Germany is listing it for 570 Euro. Delivering tomorrow. So do you think we are at the end of life of hero Session family? I don’t think so. I think it’s them basically saying “Good enough for this year for Session”, which I wouldn’t necessarily disagree with. I’d imagine there’s very little cross-over between folks that want the higher end features of the Hero6 Black that aren’t reasonably happy with the Hero5 Session (not saying they don’t exist of course, but I bet not enough to make the product worthwhile at this point). I was waiting for a Hero 6 session, I like the small size of the Session, it’s alot lighter and on my roadbike no one even notices it. But i had the Hero 4 session, and the vid quality isn’t to good in low light and while the Hero 5 session has 4k, it’s still alot worse than the Hero 5 Black. I was waiting for Hero 6 session with the same videoquality of the Hero 5 black! Also Ray what do u think about the YI 4K+? That also films in 4k30fps and on youtube doesn’t even look so bad against a GoPro Hero 5 black? I picked up the Yi 4K+ last week to play/compare with the GoPro for this review. Obviously, the price is attractive…but many…it just feels so cheap. The case is clunky, and the mechanism on top constantly falls off when trying to lock/unlock the case. The covers for things like the charging port likely wouldn’t last long either. Quality wise it’s not bad though. I think it’d be fine as a secondary b-roll camera, but i certainly wouldn’t want it as my primary action cam. Also, the waterproofing of the GoPro Hero5/6 series is just sweet. It’s the main reason it’s my go-to cam for vacations/holidays over the Garmin. I’ve got side by side footage that’s going up shortly. Been in WiFi hell, but have a bunch to share. 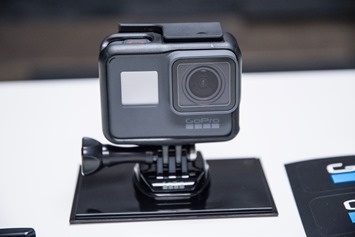 But it is €200 cheaper, comes closer to the Hero 5 session, and that mount isn’t as good either (broke 1)! Also cover ports don’t matter that much if u place it in the waterproof case, does it? 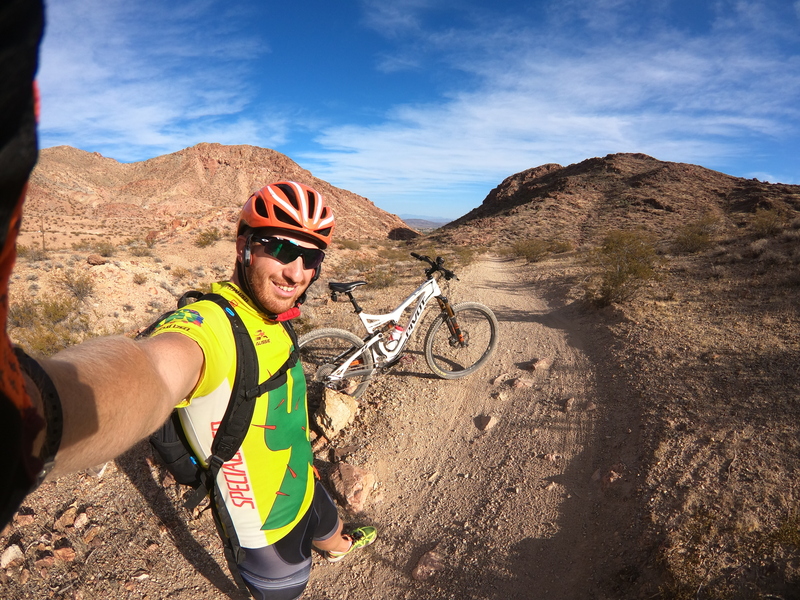 I’m not swimming with my action cams, only use them on the road/mtb-bike. I think i’m going with the YI 4K+, in other comparisons it even beats the GoPro Hero 5 black. Where did u get yours btw? Hi Ray, great review, how does the Hero 6 electronic stabilisation compare to the Hero4/5 with Karma grip combo? Thanks! Nah, Karma Grip still wins there easily. If/when my WiFi improves I’ve got some footage mountain biking showing the differences between using Karma Grip vs native stabilization. Though, to be fair, for things like walking you do get much closer than before. It’s when you get to rougher situations that the Grip pushes ahead. “I won’t likely use the desktop piece ever” – I don’t have a desktop computer. Is just working through the iOS app valid (iPad or iPhone)? Is the data quality downgraded if I save the data via iOS to say OneDrive? How much functionality do I lose by not having a desktop? Same quality actually, which is capped at 1080p either app you use. I’d need to double-check if there’s any differences in gauge overlay stuff on mobile, but I feel like the workflow is just more efficient for me to use on mobile if I’m using the GoPro Quik app to edit something. The reason I’m saying I won’t likely use the desktop piece much is that I tend to use Final Cut Pro for any edits I do (much more powerful app). And thus if I’m using the Quik app is likely just for social media or something quick, hence the desire to be on the phone. Thanks. I guess I’m going to need to get a computer first. Thanks Ray. I’m just waiting for my Airdog II and was about to order a Gopro Hero 5 Black to go with it. As the form factor of the 5 and 6 are the same, I was wondering whether I could just go straight to the 6. Any idea whether this is a possibility? Totally compatible. I’d go straight to the Hero6, as that’ll give you some spectacular 4K60 footage with the built-in gimbal. That’s as I thought. Thanks Ray. Look forward to trying them out in the near future ( hopefully ). Sadly still the same old s**t iOS app that required login, not that you cannot bypass but it’s ducking annoying. I’m almost convinced the Hero6 is worth it for that image quality and less flat/washed out photos, but I think the Virb Ultra 30 still wins out due to ease of use because of that mechanical turn on and start recording switch. After too many times trying to get action sports footage with a GoPro and it not recording or being in the wrong mode, just flicking that switch on the Virb is so pleasing. Is that a valid observation for your use of the GoPro, or do you not have that issue? I haven’t had that problem much. Maybe once or twice a year. Usually I have the problem of the button geting depressed in my bag or something. That’s it. Maybe I’m just so focused on triple-checking it’s recording (or listening for the beeps), that I don’t notice it. Ray, how is the audio quality vs the old versions? They say it’s improved, but it seems pretty similar to me. Still, I don’t have a problem with it. I’ll post an unrelated video where I use the GoPro Hero6 audio the entire time while running (+pre-running commentary). It sounds fine to me, within the constraints of having a frame case around the unit it’s fine for most things. I think if one is looking for really high quality audio there are probably better ways to get it. Another superb review. I want to ask if you know anything about a new Garmin Camera. I am interested in the ANT+ conectivity. Otherwise i will buy a hero 6 camera. Keep doing what you do. I wouldn’t expect anything near term. They say they’re focused on the VIRB 360 for the immediate future. Just one question, I’m looking for the best compromise between image stabilization, framerate and resolution. What framerate can you get at 2.7K with image stabilization? Over 60fps? Nah, image stabilization tops out at 2.7K/60 on the Hero6 Black. You can do linear mode still there though. I’d like to buy an action cam and I had doubts between the Hero 5 Black and the Virb Ultra 30. Now I have to add the Hero 6 Black to the equation. Which one would you recommend? I would use it from time to time, so if I can save some bucks, it’s a positive point. 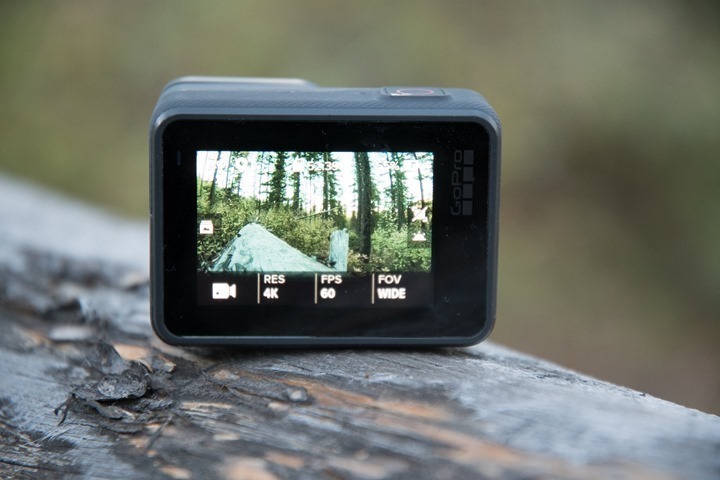 Do you expect Garmin to release a new Virb to compete with the new Hero 6 Black? Garmin says they’re focused on the VIRB 360 for the near term. I suspect we might see something next spring or summer, but for now I think they’re trying to win the 360* battle (vs GoPro at this price point). And given the software stacks, I think they have a really good shot at doing so (marketing challenges aside). I think it comes down to how much you value doing data overlays, and whether you have other devices to record the GPS/fitness data. Certainly you can use VIRB Edit with GoPro footage, but you’d still need something else to record the data on. Thanks Ray, great review as ever! 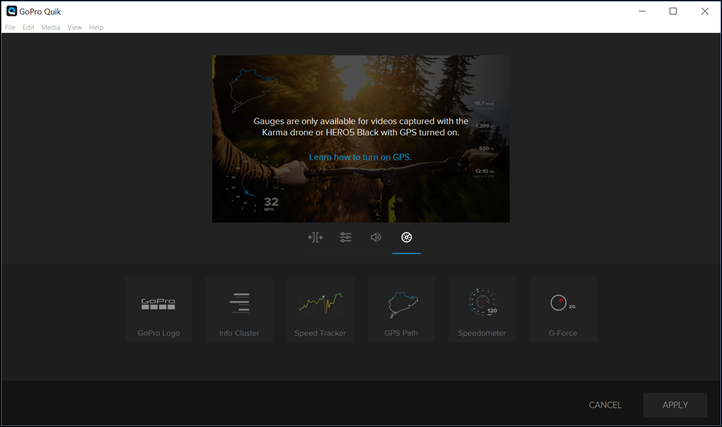 Can you explain how this would work – ‘Garmin dominates data overlays and such, and GoPro isn’t playing in the same league there. On the flip-side, if you’ve got a secondary Garmin device to capture those metrics, you can use the GoPro camera footage with that data. So perhaps that’s an option for some’. Does that mean I could use a combo of Go-Pro and Fenix 5 to achieve the same Virb effect? You just grab a copy of VIRB Edit and use that. In the beginning it had trouble with formats (resolution x frame rate) that VIRBs didn’t support, but I think they’ve abstracted away most of that so you shouldn’t have any problems. It’ll probably be a while before it supports HVEC, though (although maybe on macOS it’ll get it automatically with High Sierra since iPhones now use it). Yep, you don’t actually need a Garmin to use the VIRB software. I’ve used both GoPro footage and a cheap no name cam with a gpx file from my Suunto watch to overlay sensor data within VIRB edit. No physical Garmin elements were used at all. Is there a solution to enhance the battery life/a larger battery? The current ~2hr battery life imposes a limitation when you’re doing something where you just can’t stop to change it (eg long flights). My current Tomtom Bandit has a 3hr battery (real life) and this is enough for most purposes. Definitely interested in this too – never upgraded to the Hero 5 from my 4 Black because I’m often in situations where I need the battery backpack. This has some compelling advances (improved low light capability would be quite useful), but the short battery life is kind of a deal killer as I often have it mounted places it can’t be accessed easily so changing batteries is an issue. That removable charging door should make it possible for some kind of bolt on extra battery, so keeping my fingers crossed. 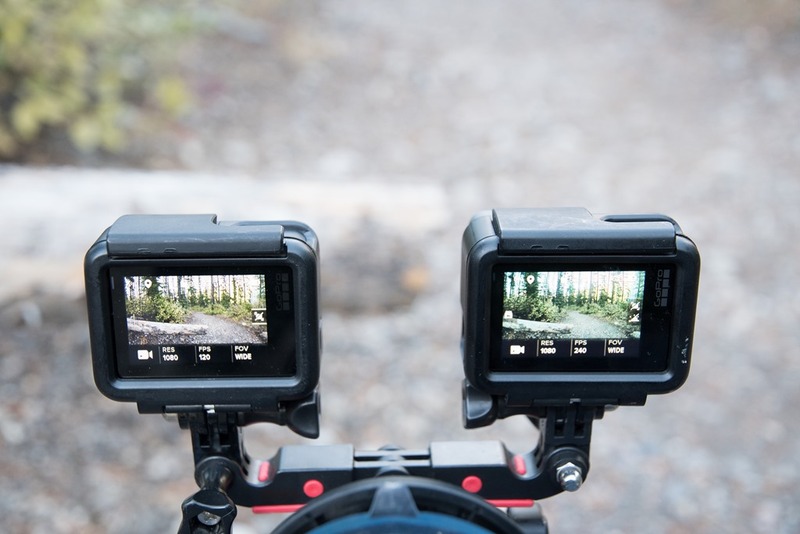 Is there a Fusion review on the near horizon… I’d like to know how it compares to the VIRB. Likely in the late October or early November timeframe. Any news on Hero 5 price drops ? You mention the ability to set long exposure – but is there a capability to set fast shutter speeds on individual photos ? I often get blur on by Hero3+Silver (yes, I live in 2013!) if taking photos whilst running. This can be mitigated a little by doing 10/1s bursts – but I’d rather be able to set the shutter speed on individual shots. No, unfortunately all pricing is staying the same for the coming year. When you use these cameras are you using ProTune or pretty much full auto? It’d be cool to understand your go to camera settings to get these shots. I for one just got my first GoPro and am looking for a balance of great quality with low editing and color correction time. Most times I just use full auto for videos. I’ll usually only use ProTune if I’m specifically planning to use the footage in something where I want a bit more control in post. Whereas for photos I’ve historically found on the Hero5 that I sometimes need to pop the exposure a bit more with ProTune. 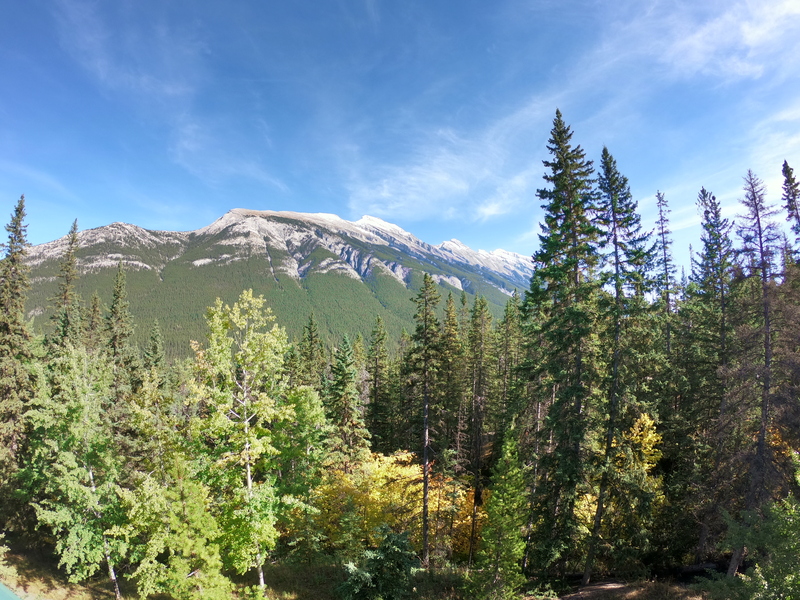 But with the Hero6, I haven’t had the need to do so (and the one time I did, I regretted it, as it then overexposed it since it would have properly exposed it on its on). Is the audio turn on something you could accidentally invoke while its in your pocket / camera bag / seat next to you while driving from location 1 to location 2 or does it use a specific phrase that one likely wouldn’t say in normal conversation? I’d hate for it to ‘turn it self on’ & get 45 mins of close up of the gear shift lever & then not have power when I want to use it again. do you mean 4K30 ? Nope, just me doubling down on 4K60. 😉 4K30 is not HEVC. Disappointing that GoPro still doesn’t support bluetooth mics. The audio on my Hero 5 is terrible. Also why does a GoPro hero 6 black, cost so much more in €? While it should be €423 it instead cost €569! Such a rip-off! As always, things cost more in Europe*. 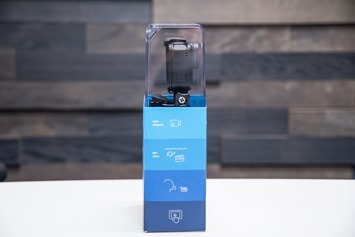 A European GoPro has a 2-year warranty, versus a US GoPro has a 1-year warranty. Given a GoPro as a outdoor action camera is far more likely to have issues due to usage over 2 years than 1 year, that cost is likely represented here. GoPro has support staff and centers within Europe, that all cost money to run, more money than in the US. 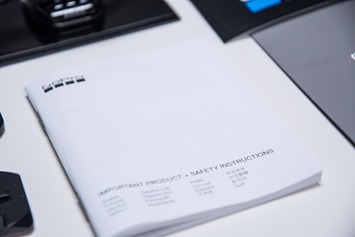 We see this across many products, especially when margins are tight. *Largely due to various employment/social/tax policies, which is fine, that’s the trade-off we have for other things that those living in the US don’t have. Ray great review as always! I’m getting one!Quick question for you do you know if there is a Hero 6 session In the works? And what mount are you using to mount both cameras on in that woods shot.Thanks bud!? I don’t expect a Hero6 Session anytime soon. Probably next year, but would be a question of whether we see them do something perhaps in the spring (highly unusual), or focused more on next fall (100% typical). Just a note that you have a typo in the comparison chart above. In the column next to “Record video from camera” you have “YS” not “YES”. 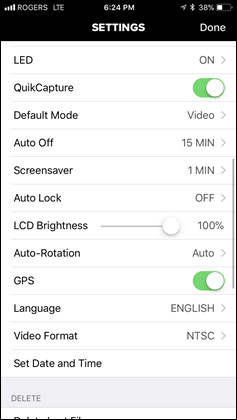 No changes to the GPS? Almost no mention of it in your post Ray. No changes there that I’ve seen. I briefly cover it at the end, but it’s basically the same insofar as I can tell (both from the behind the scenes docs I have as well as my meetings with them at their HQ a bit back). The oddity I noted was that my camera says it’s recording with GPS, but Quik didn’t pick it up. That may be because some of the footage I captured was on Release Candidate firmware, and then there might just be a simple Quik mismatch. So I’m capturing some new stuff on yesterday’s firmware and will run it through again to see if it works fine then. Either way, it’s all super basic. 1) GPS acquisition seems much quicker than it was in Hero5. I often leave the camera off in my jersey pocket while cycling, then pull it out, turn it on, wait for GPS and shoot. That seems much quicker with the 6, almost instant for GPS in most cases. 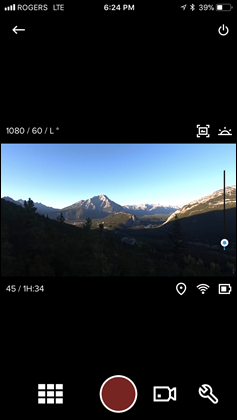 2) Exporting photo’s and video’s from Quik on the iPhone doesn’t always carry over the GPS data. I’m sure there is a pattern to it, but haven’t worked it out as yet! Sorry, OT – any plans to review this? Looks super cool (no affiliation whatsoever) if a bit pricey for what it does. Pretty, but it looks very expensive for what it does. No ANT+/Bluetooth sensors (it mentions them but it can’t display them. Does it record them in the FIT?) Speed, distance, altitude, time of day only the display? The top of the line Garmin Edge 1030, which does a whole lot more than this, costs only $50 more. Yeah, I’ve got a few, will dive into them more in the coming weeks. It’s expensive, no doubt. They’re roughly trying to be in the same category as various expensive watches. More about style than pure features. Any idea if the Hero 6 will shoot Timed Exposures in Raw mode? With my Hero 5 Black RAW is only supported in single exposure mode. I tend to sestup my GoPro to shoot a photo every 30 seconds instead of video. 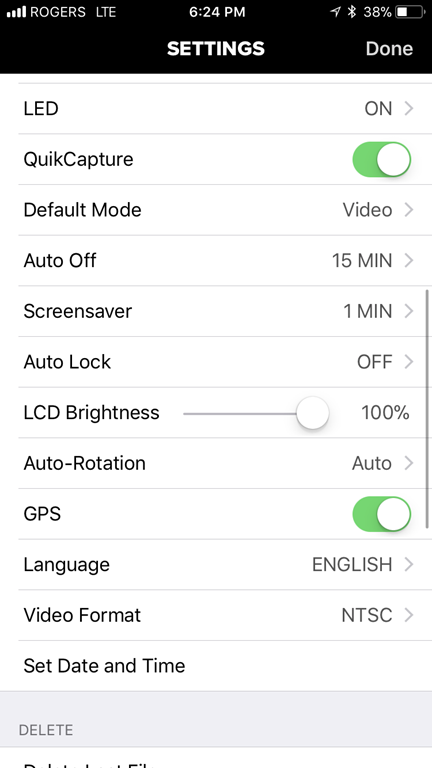 I checked on my camera, you can enable RAW photo support in photo-timelapse mode for anything over 5-second intervals (below that is disallowed). I then validated it with 30-second intervals. Looks like you’re good to go! Awesome, thanks a ton Ray and keep doing what you do! Great review. I will stick to my upgrade cycle of a couple of years since I just bought a 5 to replace my 3+. I haven’t updated my GP5 firmware as I got these 3rd party batteries that I want to use. I don’t think I missed much from not upgrading the firmware so far. I have Smatree 3rd party batteries and the latest firmware. Working fine. 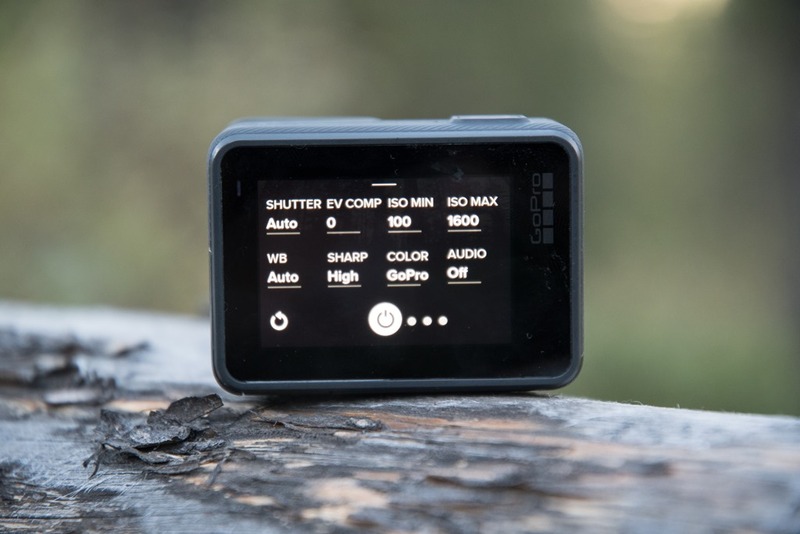 I have noticed that the stock battery has much better “hibernation” time – that is – sitting in the camera, no wireless functions activated – than the Smatree versions. I can leave it sitting a week and come back to a nearly full battery. The Smatree cells seem to bleed power much faster. I have the Smatree 3rd party batteries too. Bought them back in Nov of 2016. They offered me a refund on them..I guess Smatree had since made some changes to make them compatible. How does it compare to the Ghost 4K by Drift Innovation? Would love a short clip of the mic, maybe in comparison to the hero5 and the hero 4 ( which had an insane mic I.M.O ). Is there any option in the menus to enable HEVC in all modes? Also, what if anything can you say about the rumored joystick-enabled Karma Grip update? Ray- Does the desktop GoPro Quik app work with non-GoPro footage? Previously, anything shot with my Mavic Pro wouldn’t import into Quik, which is really annoying if you want to quickly put together a video with footage from both. I’m curious about image quality. I generally think of image quality in terms of a) noise, and b) blockiness. Noise is mainly sensor limited, so has the sensor changed? Chipsets can only compensate so much for a noisy sensor. Blockiness is a often combo of resolution, data rate, codec, and motion in a scene. I haven’t seen anyone comment on the data rate, and presumably the new codec is an attempt to keep the data rate down while maintaining image quality, but while that may work in some situations, does it work in all? If there is a lot of random unpredictable motion (I.e waves ) how well is the image quality maintained? Great review, thanks. I guess it’s a good unit for doing short video shoots. I just continue to be disappointed by their lack of battery time or way to add battery so that it can record a full ride, 8 hours should be an option. Hero6 supports cards up to 256GB, at least it says so in the manual at page 8. I got so badly burnt by horrible Hero 3 Black (unusable for the first half year, first year still a lot of bugs and freezes) that I never looked back to GoPro. This one looks really interesting but rebuying all cases, batteries etc. is a significant cost as well. 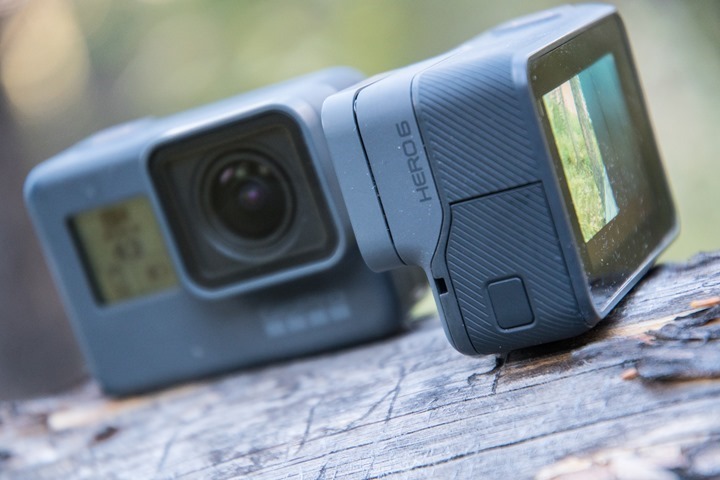 Did the later, post Hero 3 Gopros fare better when it comes to reliability? Mine froze and crashed 70% of the time even after updating the firmware about 15 times and using the best and fastest memory cards. Yeah, a lot has changed in 5 years since the Hero3. Things are generally quite reliable. I would say that in almost every scenario where people see freezes, it’s due to bad micro-SD cards (which are very common, especially fakes). h265 has been used for a long time with torrent sharing but consensus is that it simply doesn’t work as well as 264. The quality difference isn’t worth it if you mean to store the file. If the intention is for sharing faster, sure. That’s why most of the scene refuses to use h265. Correct, no case needed to 33ft/10m – same as Hero5 series (both Black and Session) as well. And correct, the VIRB Ultra 30 needs a case to be waterproof. I find you can get away without a case on sprinkling days in the frame mount, but I wouldn’t do heavy rain. Hi Ray, how is the telemetry with this new version. I currently have the Hero 5 and constantly get laggy or even false data on the overlays when compared to my Garmin Edge GPS, ie when I’m on a trail and going downhill the Hero flutters around 3-5 mph (if at all) and the Garmin shows 8+ mph. In a support case (yes I actually managed to get through to GoPro support!!!) it seems that the Hero 5 is under-powered to cope with 1080p video AND accurate telemetry. I’m hoping that the new chipset improves that! If you are in the market to get a GoPro do you think the $100 difference is worth getting the Hero 6 vs the Hero 5? It depends. I’d say if you plan to edit in 4K, or plan to do action scenes that slowing down from 1080p240 makes sense – then yes it is worth while. The other area would be if you plan to use it in scenes where dynamic range is more important (i.e. 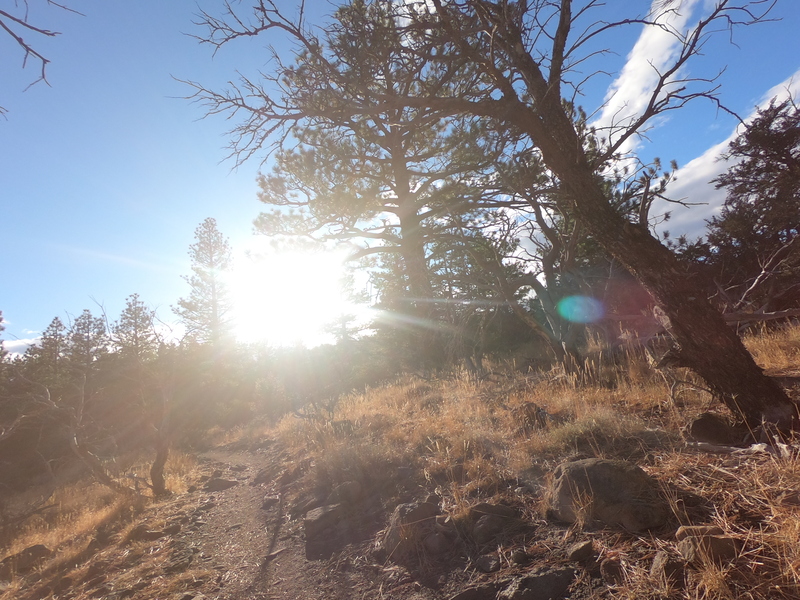 mountain biking through trees). But if you’re more using it for beaches vacations where the Hero5 tends to do pretty well already, then I’m not sure it’s worth it for most people. No, but I’m struggling to see the value there for action sports. While it’s a small camera, it requires being tethered to an external storage system for anything that’s higher resolution. Meaning, it only tops out at 1080p60 working by itself. Any faster or higher resolutions require a whole cabled setup with it. And even though it can do some really high FPS stuff, it too reduces the resolutions pretty dramatically at that point. I think there’s probably scenarios for that unit and its lens (for example, inside a car where ceiling/etc mounting space is limited, but space in a drunk for storage/etc is pretty available). But I don’t think it really makes sense for action scenarios (unless I’m missing something – and I’ve done a lot of YouTube stalking on it.). Would be great to see a RX0 review. Resolution is not all, and a lot (most?) videos are shown on displays/in frames no more than 1080P anyways so 4K does necessarily make things better. I think the challenge is that by itself I don’t think it’s a good action camera. It’s potentially good for other things. But since you can’t go above 1080p60, that’s kinda limiting for slow-mo action, or higher resolution stuff. And you also can’t get a very wide view, which can be challenging for some POV type shots (chest mount or even helmet will miss a lot of nearby action like handlebars). Those are valid remarks, absolutely. Just want to mention that for me, I usually want a narrower field of view (without “digital zoom” / compromizing image quality). I havent been able to see a side-by-side Hero6/RX0 FOV comparison, but from what I can read it seems RX0 has a narrower FOV (which is a plus to me but possible not for most others). 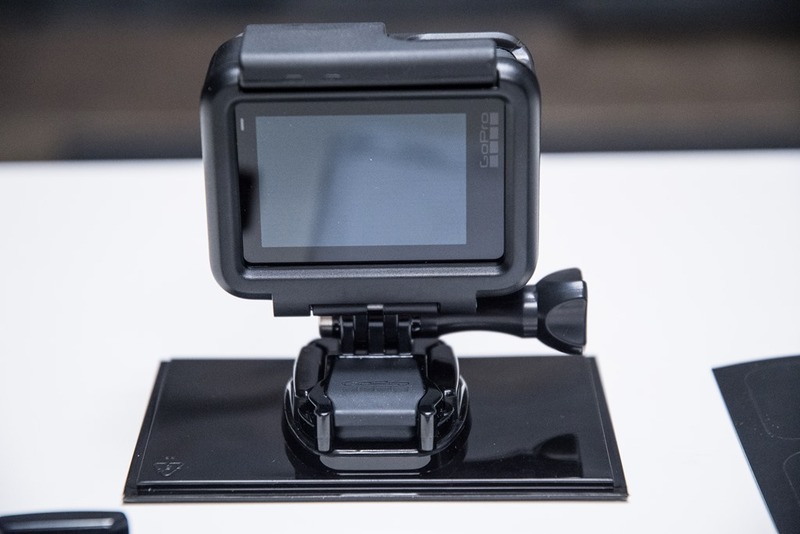 Hey DC, do you think Garmin will update the Viirb 30 this year in response to the GoPro Hero 6? Or do you think its next year (maybe first quarter of 2018) before we se anything from Garmin? Sorry, missed this. No, I don’t think we’ll see anything near-term from Garmin. Where is this setting? I’m picking up horrible gimbal noise with my EVO SS. I only see options for Stereo Only and Wind Only in the preferences. It’d be great to pick the mic farthest away from the gimbal to try to negate the gimbal noise as much as possible. 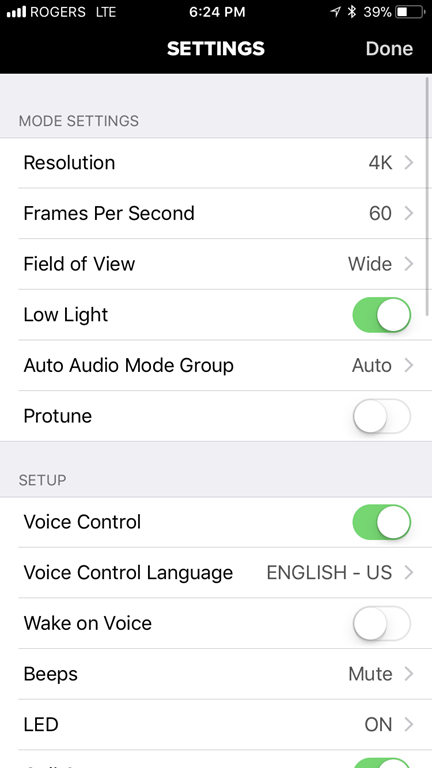 It’s under ProTune, within Audio, then Low/Medium/High/Off. That in turns forces the creation of the secondary .WAV files. Excellent, will give that a try! Will do! I did a very short test last night and found the separate wav file. When I loaded it into FCPX it showed the multiple channels. That’s about as far as I got last night. I recorded my ride this morning, but have to wait until I get home from work to see how it worked out. Just to follow up with this, using the audio trick and separating out the audio channels in post does a fairly decent job of getting rid of most of the gimbal noise, however, it’s still not perfect. If you mess around with noise filters and EQ levels, you can get out more of the noise, but the audio starts to sound compressed. Below is a youtube link that discusses this in more depth. My other issue with the EVO SS and the Hero 6 is the added weight of the Hero 6. 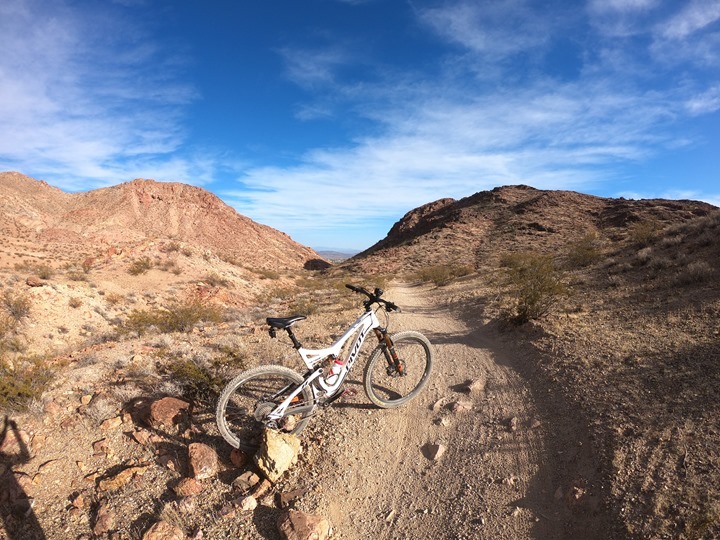 I’ve noticed I get the gimbal/gopro knocking around a bit more on the technical descents (mountain biking) as the gimbal doesn’t seem able to keep up as well with the heavier camera. I actually sold my EVO SS locally for $250 and upgraded to the Karma Grip. An excellent review but it appears to be missing the Audio comment from the Video and Audio section? without gimbal, 4k30 would be the best option for shooting video outdoor. Correct. Unless you want linear, in which case you’ll have to step down again. Is GoPro Plus still as crappy as it was when you reviewed it for the Hero5? It’s gotten better. Or perhaps I’ve just grown numb to it over the last year. Looking through my Hero5 section on it, the majority of items they have addressed one way or another. For example, being unable to upload to WiFi unless both plugged in and at 100% has been resolved. As has the incompatibilities between apps. Everything now can seamlessly pull from it. Still, there are some quirks. For example if you let your camera sync behind the scenes to your phone, that content doesn’t actually end up in GoPro Plus. I still have to sync again upwards via WiFi to get it there. That’s less ideal when travelling, like me for the last two weeks, because it nullifies GoPro Plus. I’ve got a follow-up string on some of the things I’ve seen with them, that I owe a response today on. I find myself using Plus partially as a backup, and partially as an easy way to grab photos without having to take SD cards out. Loving the Hero6 so far – performance wise it’s a world apart from the 5 for me. 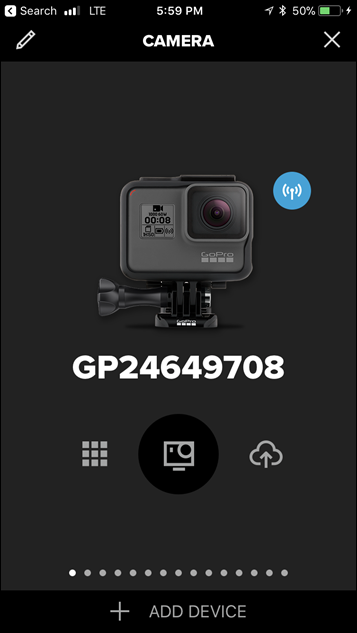 Do you think we´ll have Bluetooth 5 on the next Gopro? That would be really nice! 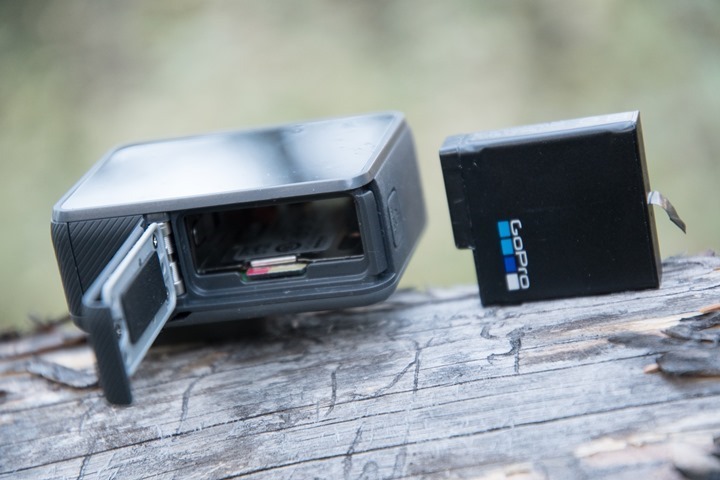 Ray – What combo garmin/gopro mount is the best bang for the buck right now? Do you have a “mount roundup” somewhere I am not finding? Just curious what it is worth spending when you go from Barfly to Garmin to K-Edge price-wise. Yeah, the TT side is tough. I know K-Edge was planning something there, but I don’t think it ever happened. There was something I saw recently for a mini-GoPro mount below the aerobar at Interbike. For the life of me I can’t remember who made it…will have to ponder a bit. For the road bike, is the Garmin mount the best deal and will it work with 920xt? The Velocomp one is definitely a beast, and more secure, I’m not sure it’s worth 2x though. For road-bike, I prefer the BarFly Prime or K-Edge out-front. Either way, a metal mount. The Garmin is plastic and I don’t want the slide bit of bounce you get on plastic. I can’t take credit there, but no worries – I appreciate the the attempt nonethless! Not sure if it’s just my browser loading a cached copy of the webpage, but the comparison with the Hero5, Sony, Yi and VIRM is still listed as: “[Video Uploading Slowly on Hotel WiFi]”. 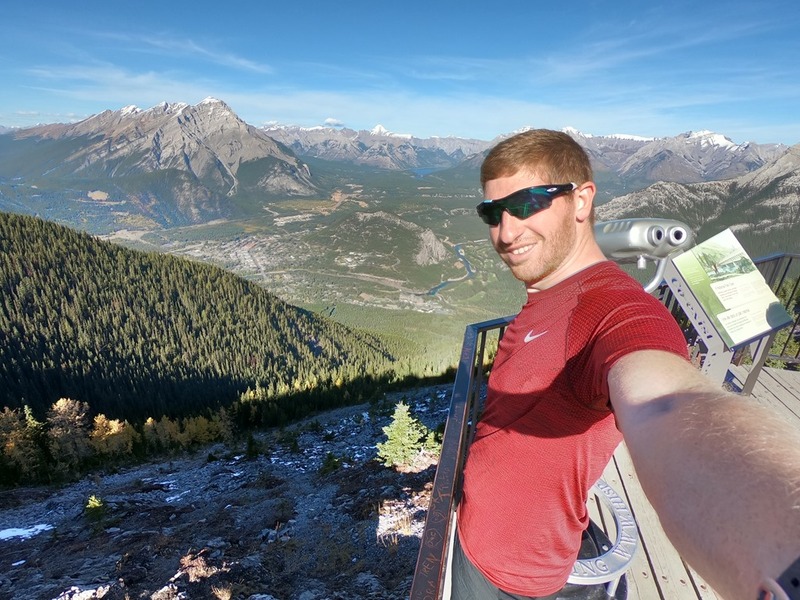 Love the review, that camera were you using to take the photos in this review of the go pro? THANKS! With 240 FPS @ 1080P I wonder how one of these would be for doing running analysis on a treadmill if put on a small tripod? Any chance of trying it out Ray? Hi Ray, I am seeing some issues reported on the internet apparently related to the firmware update to 1.51. Have you updated the firmware and have you experienced any issues? Nope, nothing. 1.51 is the production release for launch, meaning, the firmware that units produced these days would get, and the firmware that you would have gotten on Day 1 (launch day) when you powered on your GoPro and it downloaded the first firmware (it would have had a more stale version on it, due to stockpiling units ahead of launch). I wondering what the shooting distance would be and the angle under water. My idea is to place it stationary and film when I swim against it but how far will it be possible to see what I am doing. Do you have any experience using it for this? With a pool with clear water, you’ll pretty easily capture at least 10-15m down the lane of usable technique footage, if you place it on the bottom and angled up. If you put it on the deeper end (if your pool has that), then you’ll get the further range of it. I tried tried VLC with the latest version on Windows 10, and it kinda works. It plays back audio, and seems to play a frame or two of the video. I suspect this is an issue of VLC on my machine and not enough power or something. I will note that the native Windows 10 player plays back the HEVC video just fine. Thanks for your fast reply. That sounds as the perfect camera for the job. Do you think it will able to capture more lanes? I can’t seem to find any handy footage from the Hero5 or Hero6 that I’ve taken and posted anywhere in the pool (though I often use it). In any case, typically you’ll capture the lane on either side, though the visibility of your stroke is sometimes blocked by the lane markers. If however you place it directly on the bottom pointing straight up, and in the deep end – then it’s actually really good for multi-lane swimmer comparison. Ive had a real issue with gimbal motor noise and my Hero Black 5 …. whilst the Hero 6 has better stabilisation, with a gimbal is this likely to be the same game???? Im planning to buy either the hero 5 black or the hero 6. There’s no issues for 64GB memory cards on either Hero5 or Hero6, both are totally good. It’s really only once you go above 128GB that it can get a bit tricky, but even that I believe is now solved. 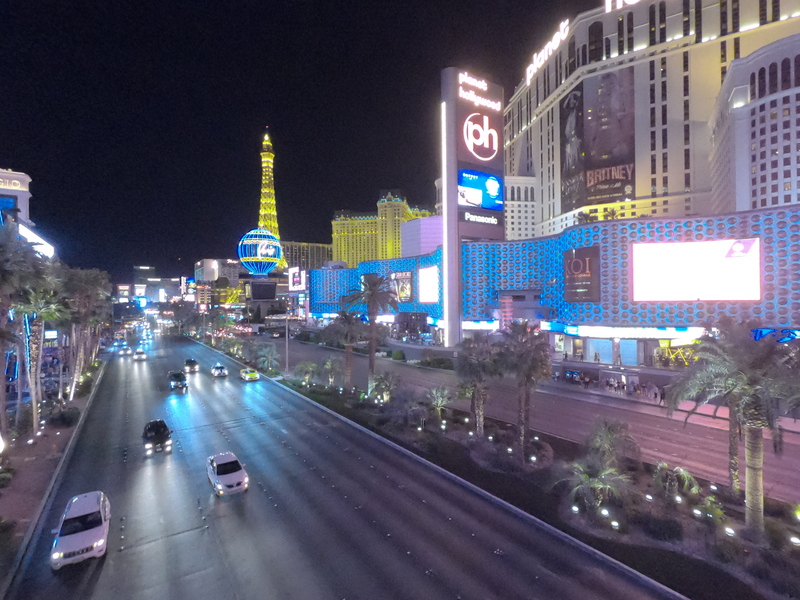 how are you converting from H.265 to H.264? I’ve taken some footage in H.265 but am struggling to find software to edit it with. I’ve been using an app called ‘EditReady’, found it online randomly and paid for it. I can’t say I’d really recommend it though. It’d often crash, and then I’d have to start again. I’m totally open to any other options as people find them. Note that I was concerting from H.265 to ProRes, mostly because I was trying to be 100% sure I wasn’t losing *anything* quality-wise for review sake. But if it’s just me doing it again, I’d probably go to H.264 to save the massively huge files. There really isn’t any software to edit it. You have to convert in HandBrake (see GoPro community comments) and then edit in whatever you usually use. Even FCP hasn’t gone to it yet, even though Apple is moving that way. So you are screwed if you want to just shoot and edit video with this thing. As with my previous GoPro (the Hero 3, which I gifted to someone smarter than I), I cannot figure out how to manage any of the files coming from this thing. 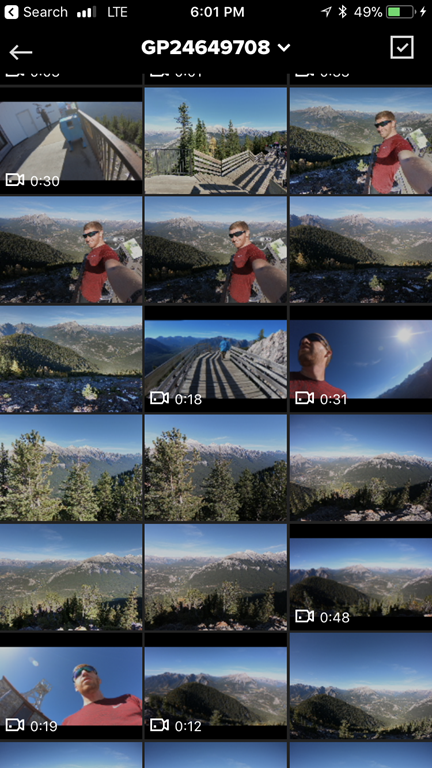 I shot a time-lapse video in GOPro, and yet, the files are completely foreign to any software I try to see them in. I don’t even know what’s in these files… it’s a mystery!!! I’m sending my GoPro back, and admitting defeat. I’ll shoot stills, or video on my “regular” camera. The GoPro just slays me. Hmm, all files are pretty standard, except the new HEVC files, which are a trickier duck (as I discused a bit above in the review). But for a timelapse, you won’t get an HEVC file, rather, just a regular file. The only thing I can think of is if you’re accidentally trying to playback the preview files and not the actual video files, which would definitely not work on most apps/platforms. Had to upgrade to the latest MacOS High Sierra. Go figure. Thanks for your help. Yeah, High Sierra supports HEVC files, whereas previous versions don’t natively. 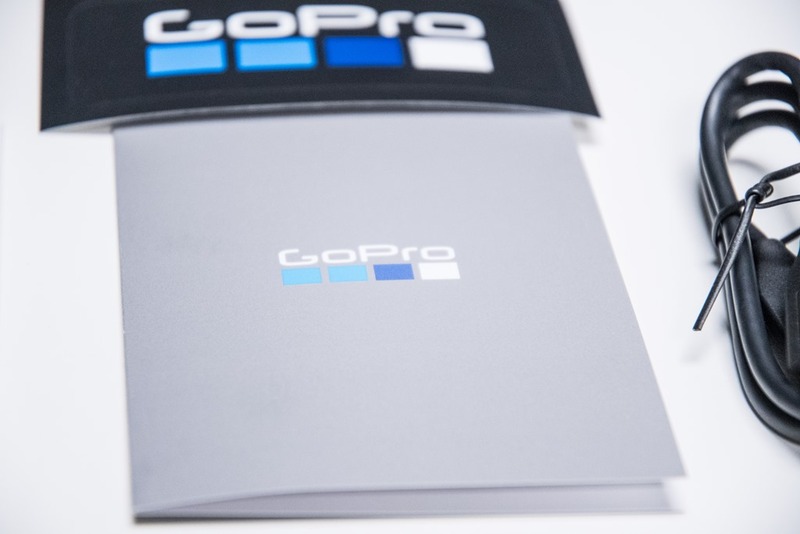 Hey folks – just as a super quick heads up, Clever Training is running an awesome deal from today for the next 10 days on the GoPro Hero6 (yes, really, Six), that gets you a $75 credit, plus a 32GB MicroSD card for the same price as before – $499. You can use/spend that credit immediately, even with free shipping for everything. any ideas as to how to fix the problem would be greatly appreciated? I think your evaluation is well-done and quite thorough but the fact that you can record all this fancy video and can’t watch on high-end computers using high-end programs is a deal breaker for me. I have to literally waste tons of time converting everthing I shot due to this new H.265/HEVC format. 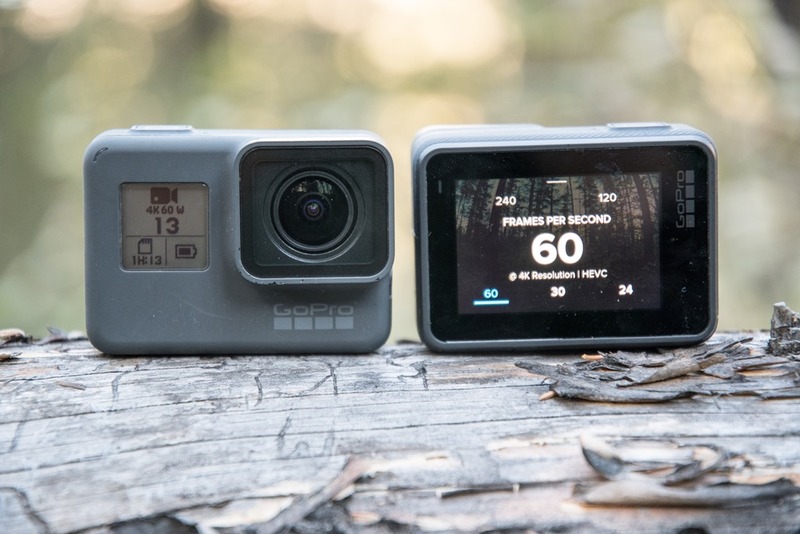 If GoPro wasn’t wasting time developing this ridiculous Quik “auto-editing” program, it could have upgraded the ever-trusty GoPro Studio (which GP NOW doesn’t even support) to handle the new H.265/HEVC and everyone from first time user to hardened pro would be happy. What an amazing, short-visioned oversight!! 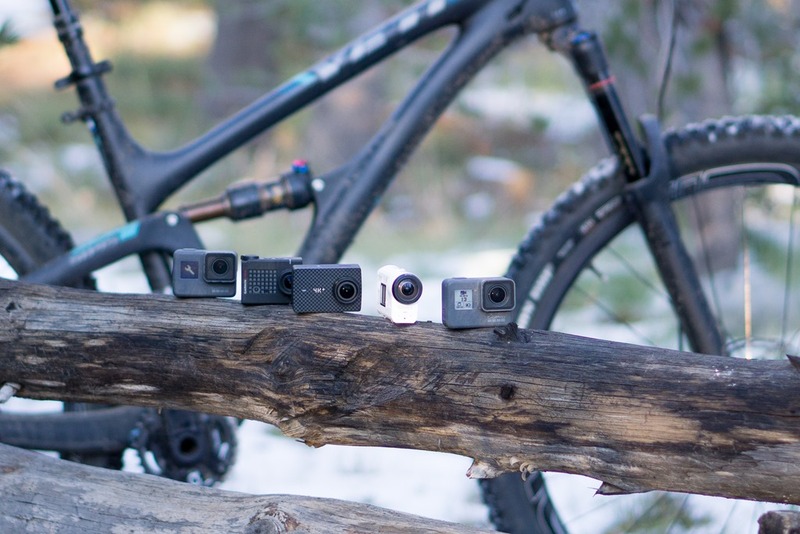 I am a GP dealer and I am recommending people just stick with the 5 until GoPro admits to and adjusts for this oversight (which GP terms as “evolving”). For all but a few who can wade through the steps one has to wade through to get any use out of 4k 60fps vids, this camera is not ready for prime time. GoPro, what were you thinking? Or were you? Actually, I did note the limitations of HEVC. But that’s only for 4K60P content and 1080P240. Either way, I noted it in the post and how frustrating it was. 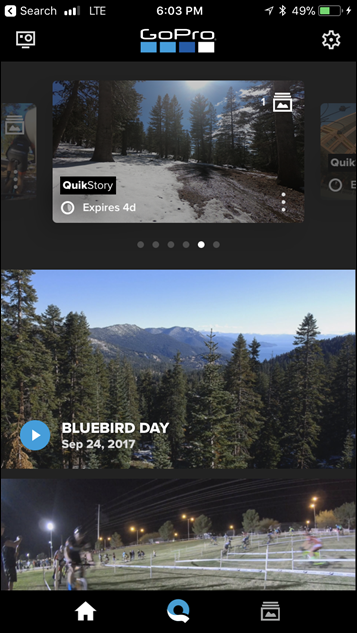 Either way, hugely popular apps like Premier and iMovie already support it (iMovie supported it the day before GoPro released it). And Final Cut Pro is getting it’s update before end of year (could be tomorrow or in two weeks, we don’t know). Yes, agreed you did. I guess the gripe that I have is two things… iMovie and Premier pretty much have to be running on computers made in 2016-17, at least according to GoPro. So this really leaves out a lot of users. And I use Final Cut, which you have noted seems to be in limbo on this subject. And the other is the complete loss of GoPro Studio which was created from a much more highly developed program and simplified and then given free to users. Now GP has stopped supporting Studio altogether and has fobbed on us Quik, which I personally think is for kids to use. They offer sophisticated setting like 4K/60fps and then give us a joke of an app to edit it with. And then they wonder why they keep losing market share. Anyway, I updated reluctantly to High Sierra’s second iteration and can read anything that comes out of the GP6 now. But as a dealer, many of my customers are still having trouble with this new codec. I truly wish GP would use some common sense and upgrade and re-instate Studio. By the way, if you use it underwater, you pretty much have to use the super suit after 5 feet or so. If taken down deeper, like 30 feet, the pressure screws with the touch screen and it just records and doesn’t shut off, the screen locks into one image so you can see what’s being shot and it runs until the card is full or the battery runs out. I live on an island and many local dive shops report this is also happening to their customers. So while it may not flood until past 35 feet, it is not usable past 5 feet or so. Just FYI, buy the suit. The only thing that stops this is removing the battery, which you cannot do at 30 feet. Thanks again for all the great insights and discussion. For the screen, you can simply lock it – just like the Hero 5 Black: Just swipe down from the top and select the lock icon. Problem solved. For GoPro Studio, it was useful for tweaking the edited footage from a Pro mode standpoint, but realistically almost nobody used it – especially not to edit. I’d rather GoPro focus on getting those type of tools natively in FCPX and Premier, and then separately focusing on beginner tools like Quik. I shall try it in the a.m. Would be wonderful if that’s all it is. Studio was/is a fast way to pre-edit some clips and do a little color tweaking before bringing it in to FCP. It also functions similar to Photoshop for quick 30-second clips w/music & titles. I personally, as a dealer, found it handy and could easily run through the steps for new users. I totally agree with your 2 cents on focusing on working on getting GoPro up to speed with higher-end editing programs. Such amazing footage needs to be paired with a much better editing App. (anything but Quik). Thanks for your very informed and responsive replies. Hmm, I haven’t seen or heard of that. Any chance the USB cable just happened to die? Or worse yet…the port? Any other cables handy? Not able to do the 2 hour route (90 mins north of NYC) but will definitely buy one to get here on wednesday. Didn’t much think of that. Only had the camera for 3 weeks, and was not very happy trying to get the game downloaded and spliced together! I echo your pains on the HEVC encoding. 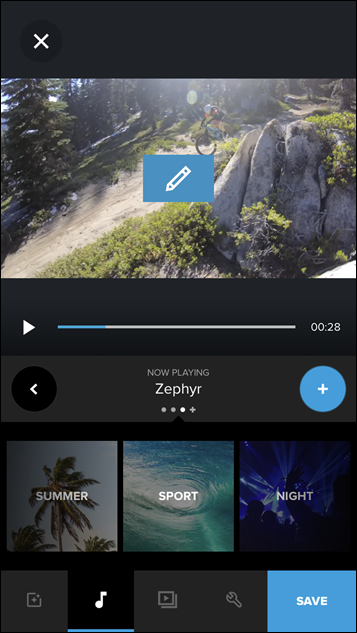 I only ever used the go pro desktop app for putting the video together for my Hero 3. Oh well. Thanks for the reply. If this doesn’t work, is GoPro support typically helpful? No new cable able to connect it, used the online support chat, had a RMA set up and camera is on its way back to Cali. This happened with my hero 3, but after several years of use. Hope I just hit the usb lottery and the next one keeps working. 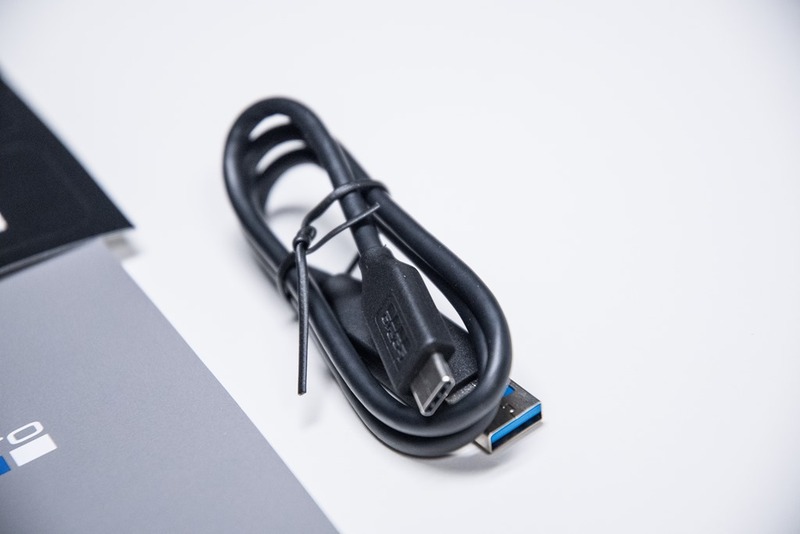 Good news, now I have an extra usb c cable! Just got back the replacement hero6, just about 2 weeks, cannot complain about that! Now if they’ll just resurrect studio…. I upgraded from a 3+ to the 6; you can imagine how blown away I am! A couple questions about photos. How does using the zoom feature on a photo compare to simply cropping it later? Also how do the screen grabs from video look? Are they comparable or less quality than using the photo mode? Thanks for the thorough reviews! Yup, the zoom feature is 100% simply a crop. 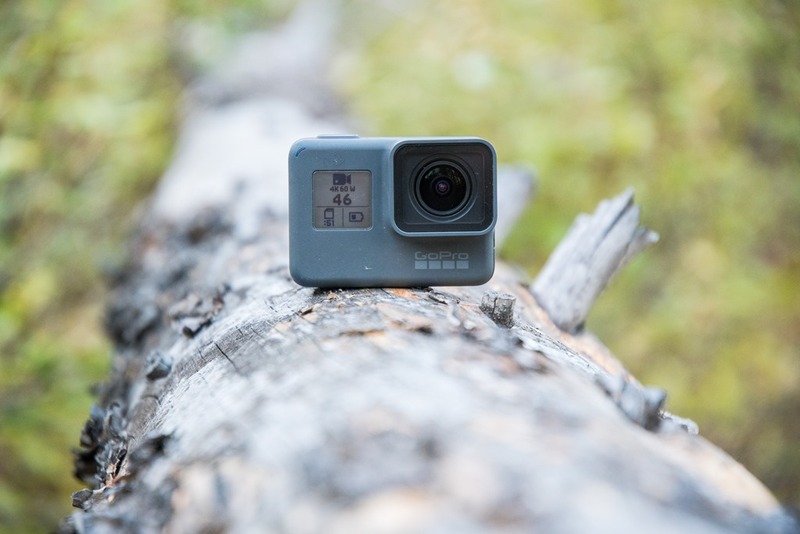 GoPro noted that basically it was to make peoples lives easier than doing it in post, in that technically things like medium is just a crop of the larger sensor size in video. 1) If it’s fast moving and there’s less than an 80% chance that I’ll get the timing just right, go with video and grab a still (go with higher frame rates like 60FPS or more in that case). 2) If it’s slow moving (like just a landscape or such), then I just take a single pic, usually in linear mode if a landscape shot, and then if something super close-up/epic, then in wide (often involving lots of sky/etc…). I’ve had one of those horrible circular conversations with GoPro support over email that has taken over 2 weeks, and they have now seem to have forgotten the original question and are offering solutions to problems I don’t have! 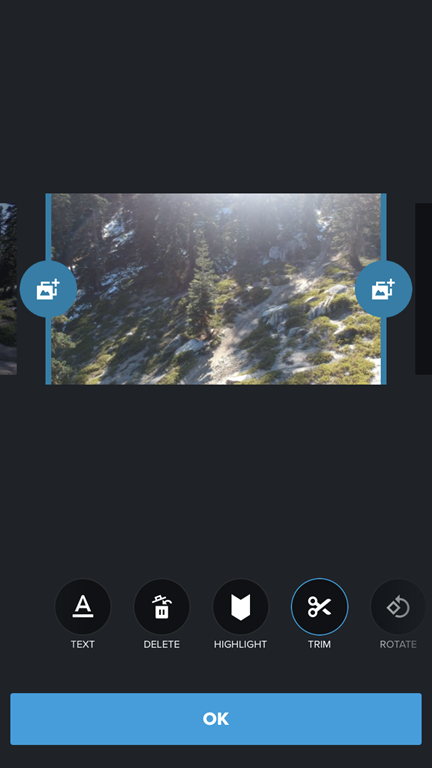 This issue I have is if I have a video with GPS data recorded, and then “Grab a photo” in Quik (desktop or iOS) the location data is stripped from the image. Have you (or anyone else) got this to work? I have just received a new Hero 6 camera. I was having trouble trying to connect to the GoPro app on the phone, it kept saying WiFi password was not correct. After some time scratching my head I changed the WiFi from 5GHz to 2.4GHz. It worked perfectly. Back to 5GHz there is no way to connect to the camera. c) A light license is required for operation and must be purchased from Ofcom. That’s a nice review, thanks. When my GoPro Hero 6 arrived, I thought it was a mistake. GoPro Hero 6 is almost identical with Hero 5 in terms of physical appearance. After I charged my GoPro Hero 6 Black, took some photos (you can take HDR photos with Hero 6!! ), my camera started to freeze. I updated the software, but this didn’t solve the problem. Then I found out that the issue is with the SD card. I bought GoPro Hero 6 as a bundle, with an SD card that I haven’t heard before. Than I red a review from link to divewithseaman.com and found out that I have to use SanDisk Extreme, Extreme Plus,Extreme Pro UHS Video Speed Class 30. I bought SanDisk Extreme 32 GB and the issue solved. I loved the dynamic range and the bright colors with GoPro Hero 6, however, sound is worse than Hero 5. As a skater, I am able to create high quality slow-mo’s with this camera. This is all I can say for now. 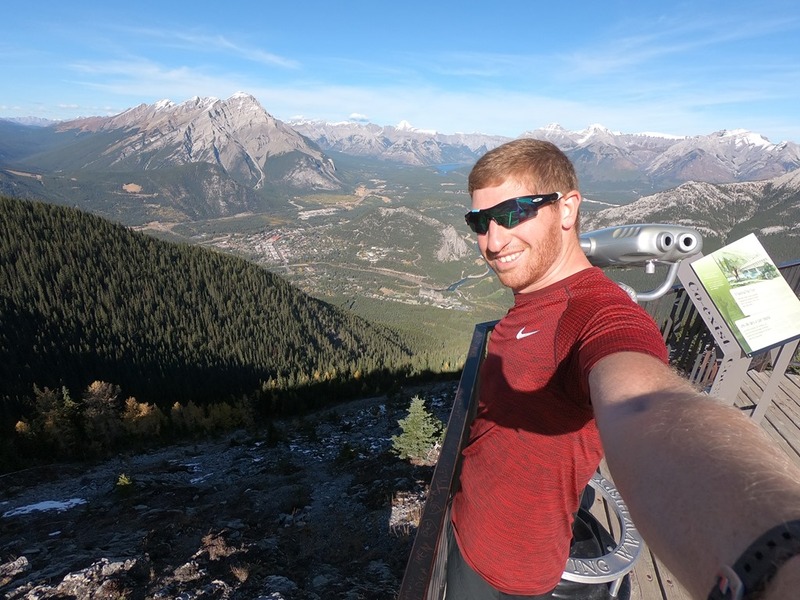 Great review, great web page – the most detailed descriptions I can find (if I only read more carrefully your comparison of GP5 and Garmin Virb 🙂 ). I would upgrade my GP5 to GP6 for some features (HDR, stabilization for 4K, generally better stabilization). But other stuff keeps my waiting with decision till GP6 reaches maturity (people were complaining e.g. regarding graining problem – not sure whether solved) and due to some hesitation because of lack of compatibility of file formats, lack of simultaneous video+timelapse (which I use extensively in GP5), price. 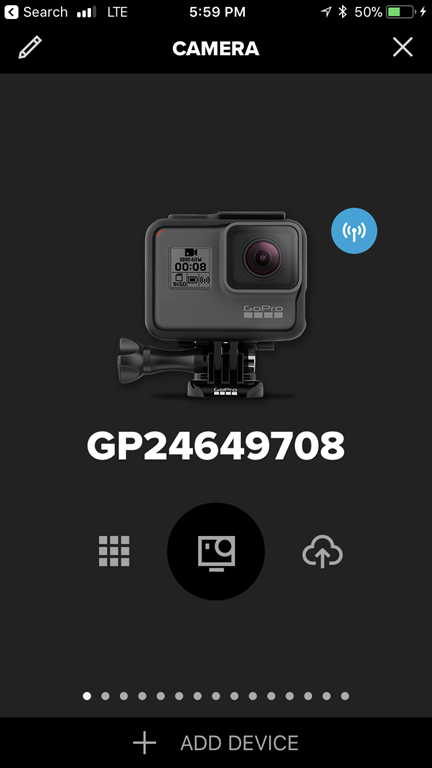 One of the main reasons I bought GP5 was recording of GPS data and I found it extremely limited what GoPro apps could do about it. Especially when you wanted to treat long video coverage recorded in several files as one piece of video and enjoyed its metadata visualized to maps and charts. My disappointment led me to developing my own solution by means of web service trassy.pl. TBH presently my favourite setup is to switch off GPS in GoPro and record GPS data from my mobile. Regarding GP5 I am gaining longer battery life, regarding GPS I am gaining better quality GPS data from mobile than from GP5. Afterwards, I am still able to combine both video and metadata into interactive presentation. as hero 6 is waterproof, and does not need the cover in order to be mounted to bike, can it be used without cover for bike front mount? or you need at least a cover for lenses? any experience? can it be used for cycling without buying additional cases? The housing or cover is not needed above 33 feet (10m) so yes, it is great for bikes. The front of the 6 is actually not a lens but a removable glass cover that is taken off for use with a protective housing. So if used without the housing, if the front protector was damaged it could be replaced by just taking off the old front plate and putting on a new one. But the housing adds one more level of protection. So it is kind of up to you and the terrain you are riding in. 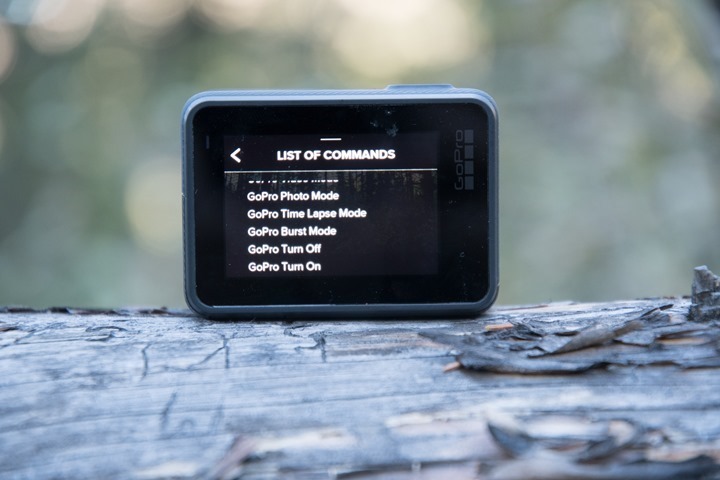 Can use our garmin edge bike computers to start and stop recording? Also can we have power, HR and speed shown on the footage as well? Is it easy to edit and upload to facebook and instagram? No method to trigger the two together unfortunately. 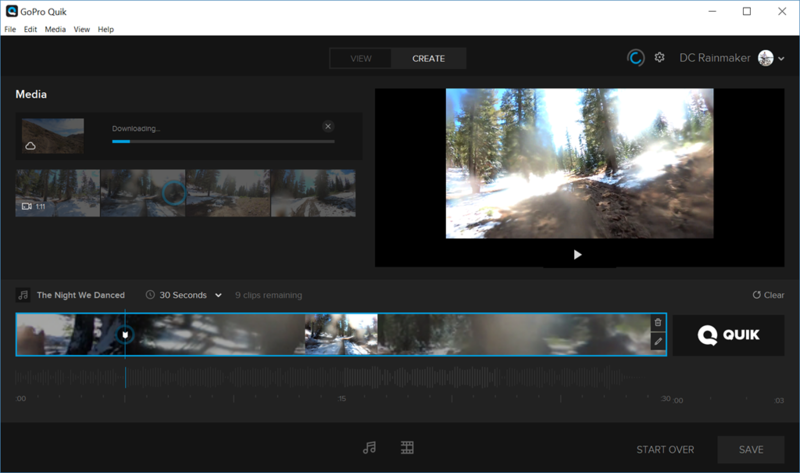 However, you can import in GoPro footage into Garmin VIRB Edit (software app on desktop) and then tie-in your Garmin file and you’ll be able to do overlays and such. Have you uploaded the image stabilisation comparison video anywhere? That is exactly what I am trying to find the answer for Jono. I am mightily confused. I used an old card (Kingston 16GB) and it keep erroring now and have tried reformatting etc but its still no good. Did you find out or come to a decision in the end? I use this Samsung card and haven’t had an issue with it yet. I recently purchased a Hero 6 and will be using it on my road and MTB bikes. It will be mounted on the stem and seat post. What settings do you think are best for this activity? Great review! I’d love to see the stabilization video that you referenced. Though the page says “[Video Uploading Slowly on Hotel WiFi]”. Is that video available somewhere? Thanks! DC – Great review! Quick question: I’m getting ready to go on a trip to Europe and I just got the Hero 6. I have iPhone X and latest IOS. I noticed you mentioned above certain files not supported but wasn’t sure if this was updated information? What resolution would you recommend for me to use to be able to capture high quality video of the city and hiking while able to transfer to my iPhone over WIFI to post online? These days all files are supported (especially on the iPhone X), so you’re good to go there! I’d recommend doing 1080p60 in general, unless you have a specific use-case in mind. You would recommend 1080p 60 FPS over 24 FPS? It can be used as slow-mo. Which gives you flexibility for interesting moments or to slow things down a tough when you’re short on footage in a montage. 120FPS gives you lots of flexibility, but costs you more space and transfer time. I wouldn’t shoot in 24FPS unless you’re specifically planning on timecoding everything at 24FPS because you’re looking for a certain look (said differently: unless you know what you’re doing, I wouldn’t shoot at 24FPS). A) Simply buy more cards, cards are cheap. Downside is that it’s ultimately easy to lose a card, especially on vacation. Really easy. B) Offload to phone: This is viable, but unless your phone has a 256GB+ hard drive, you’re likely to blow through storage pretty quickly. 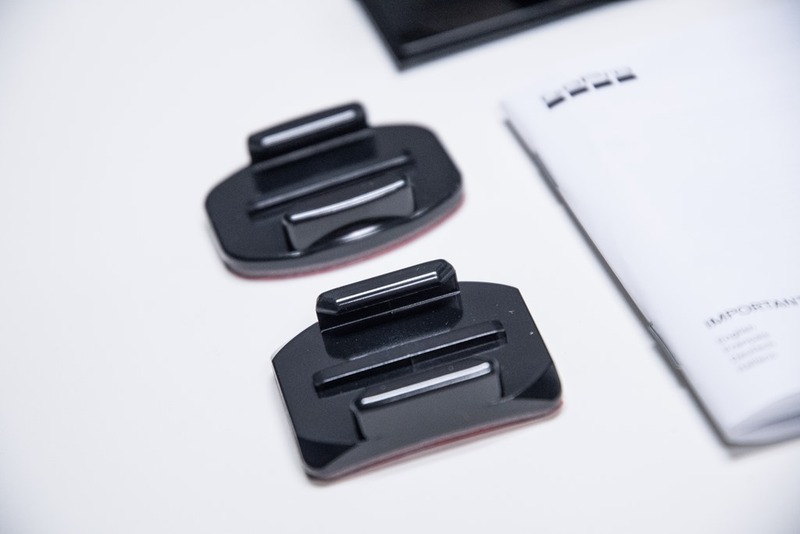 C) Look at a small device with an SD card reader, like this: link to amzn.to – that allows you to offload to a USB thumb drive or such, which are cheaper and less likely to be lost because their bigger. Or, if you have a small USB external drive, it’ll work with that too. Thanks for the great review. Is it true that Photo+Video feature is no longer able in GoPro 6? I always use this feature for diving. Now I’m thinking of going back to GoPro 5. But I’m blown away with the GoPro 6 low light condition upgrade. Can you give me advice? Thanks. Just to follow up, I think the Gopro article confused me. The Hero 6 has HDR and the Hero 5 I believe called it WDR. This is my conclusion after finding no reference to WDR in the Hero 6 Black manual.